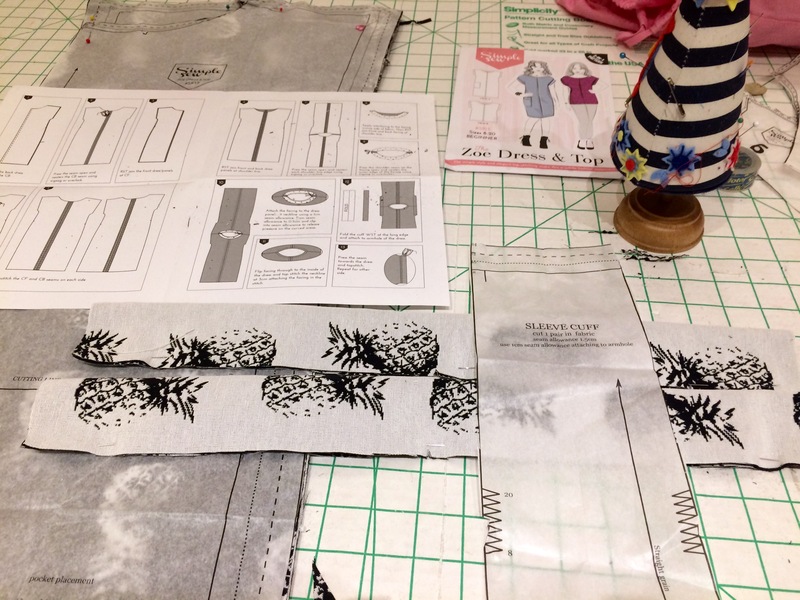 In all the years that I have been making clothes, sewing and crafting, I have never made myself a party dress. 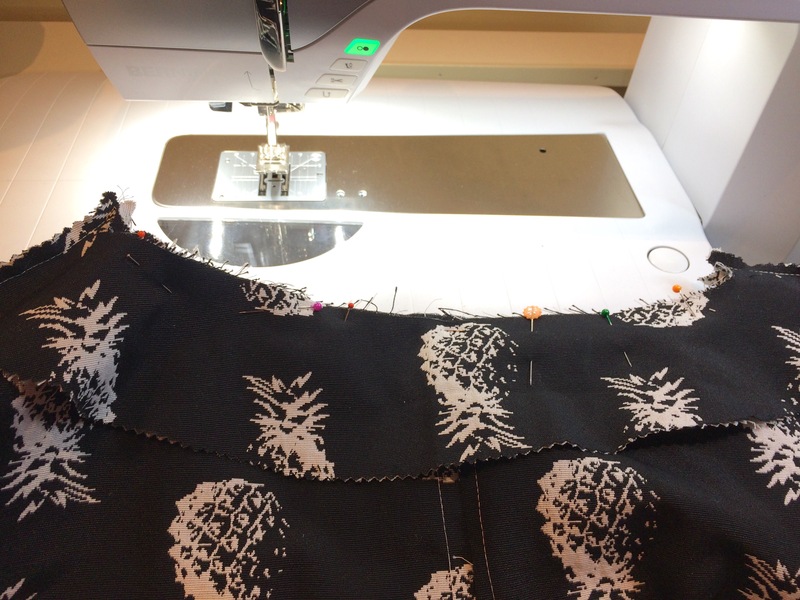 I make an extravagant birthday occasion dress every year for my 5-year-old so I am no stranger to the dramas of working with slippery, fragile and fine fabrics, so I decided it was time for some selfish sewing. 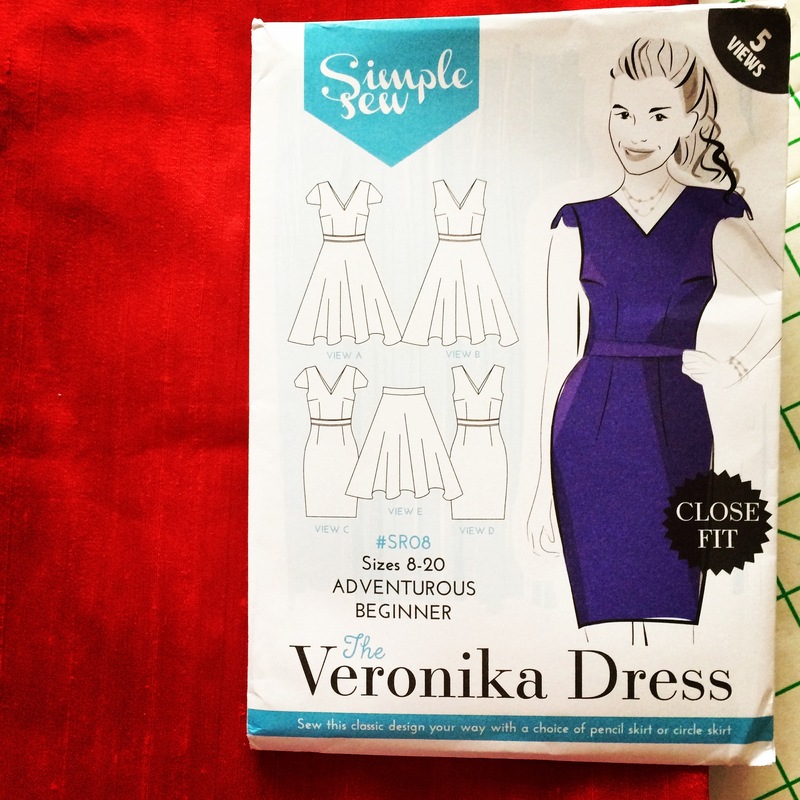 I was inspired by the name of Simple Sew Patterns Veronika Dress and decided she was going to be a red silk beauty. 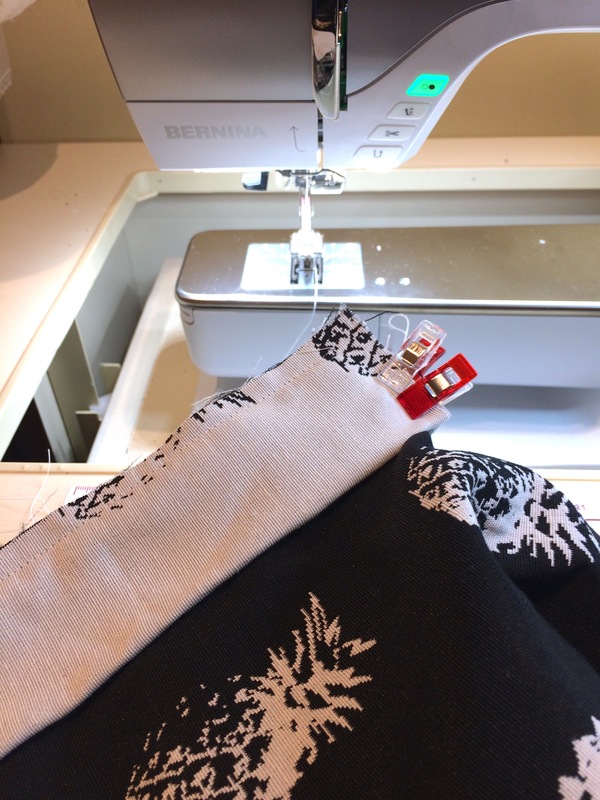 I couldn’t believe luck that the fabulous people at doughtys had exactly the colour I needed, click the link to buy the same gorgeous fabric. They were very generous and gave me the material to make this dress. 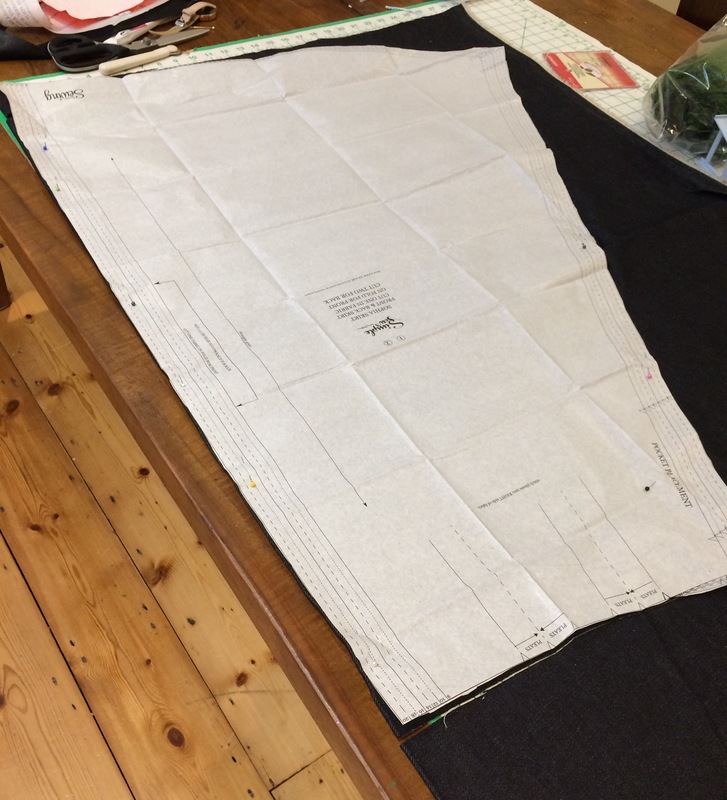 The pattern said 2.7 meters was needed but I managed to cut it out of 2m, so will have some over to make The Little One a party dress from the remnants. 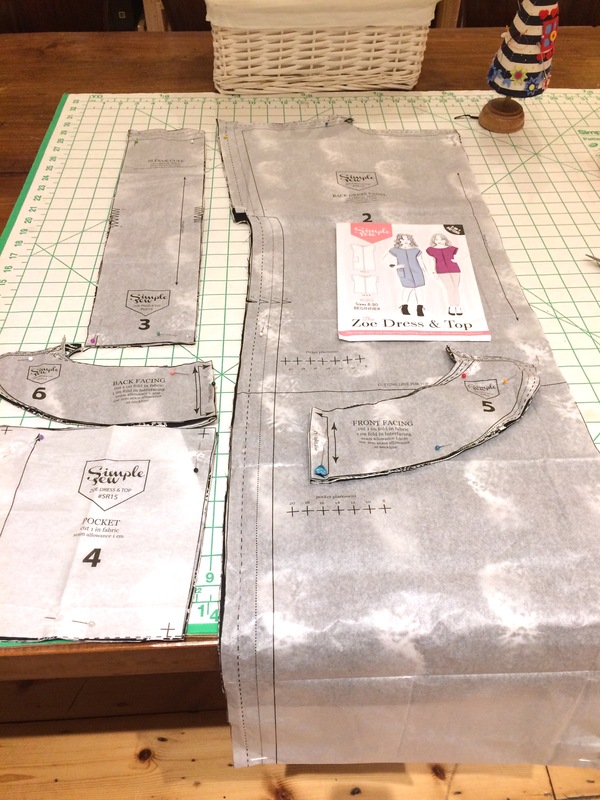 I aim to practice a zero waste system in my dressmaking, so no scraps will go wasted from this fabric. The larger ones will be used for a dress for my daughter and the small ones go to her old nursery school for crafting and anything left over is made into dolls clothes. 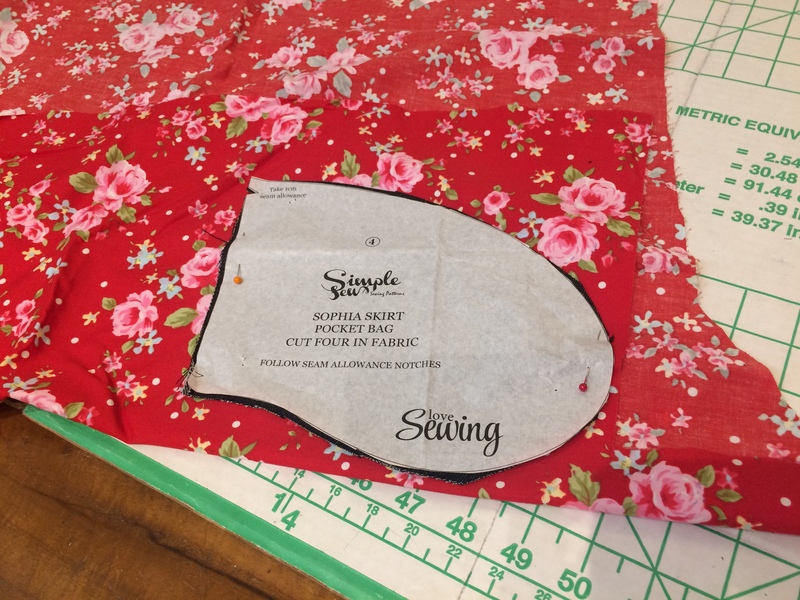 So on to the layout and cutting…it was so lovely to cut into, very satisfying, my favourite part of creating is cutting the fabric, I have no idea why I like it so sew much. I take ages doing this part as I am trying to aim for zero waste. 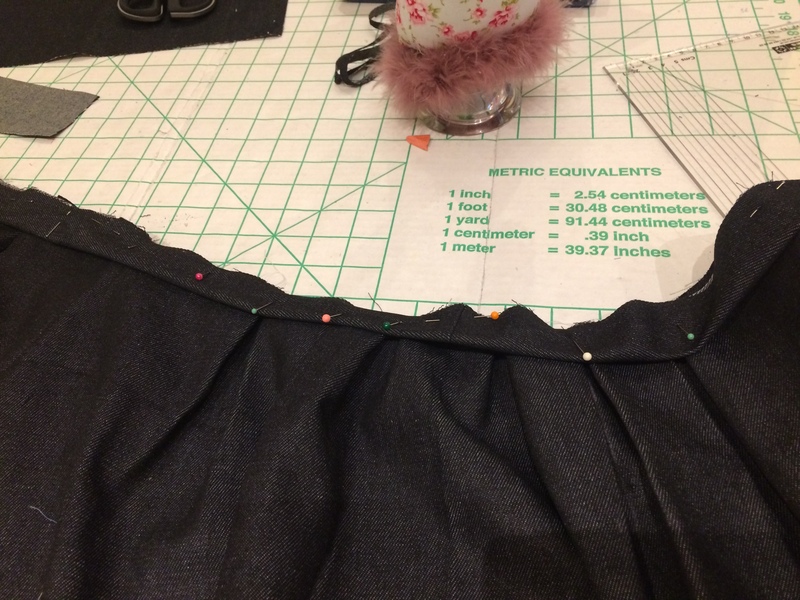 First I cut the skirt, look at the fullness of this skirt, so exciting. 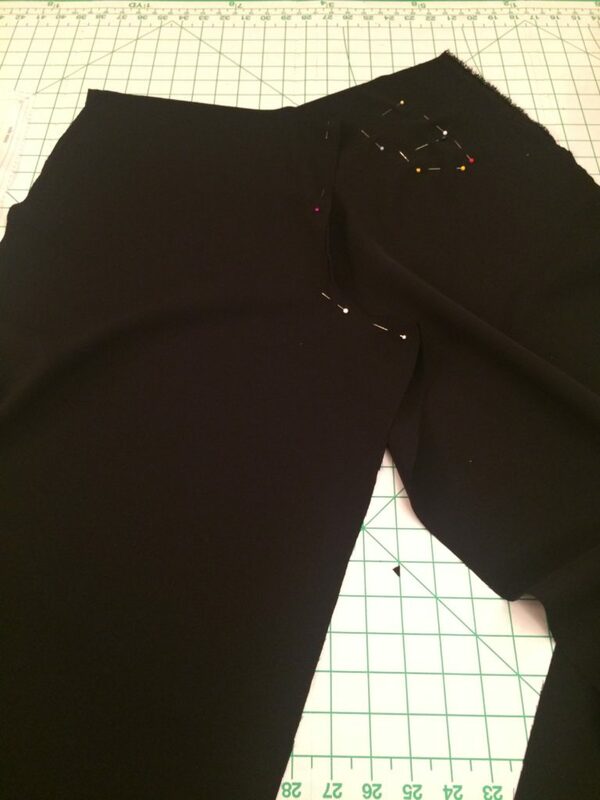 Wow this skirt is going to be great for dancing in! 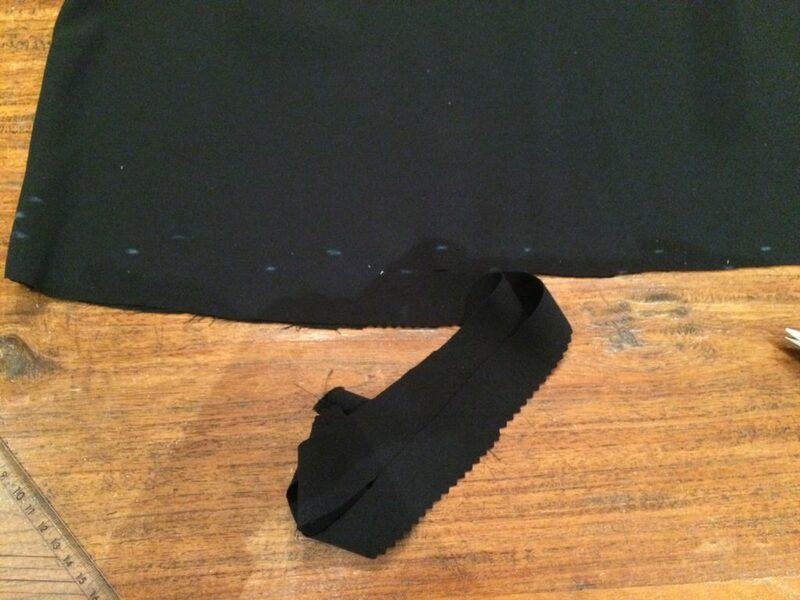 I then cut the front bodice and tacked the bust point (you can just about see the black cotton. 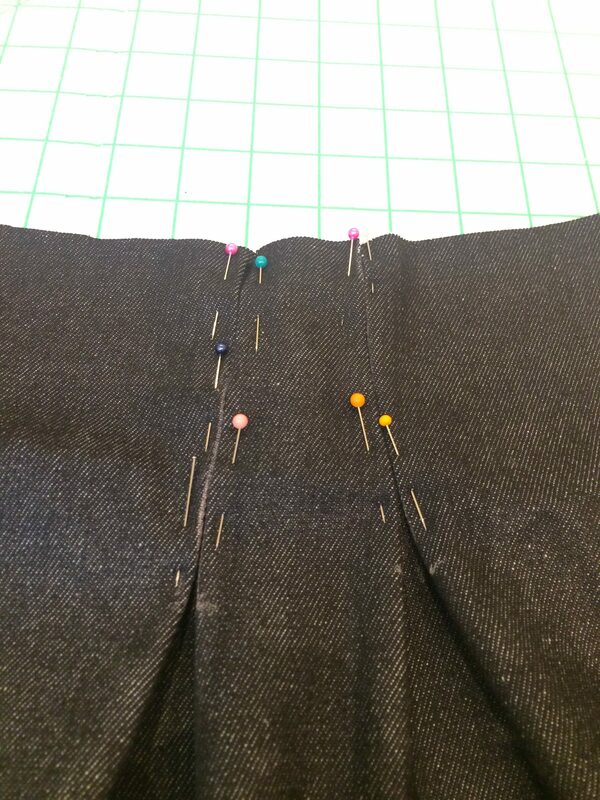 I then pinned the darts. I did this so I could try it on again to see if any further adjustments were needed. 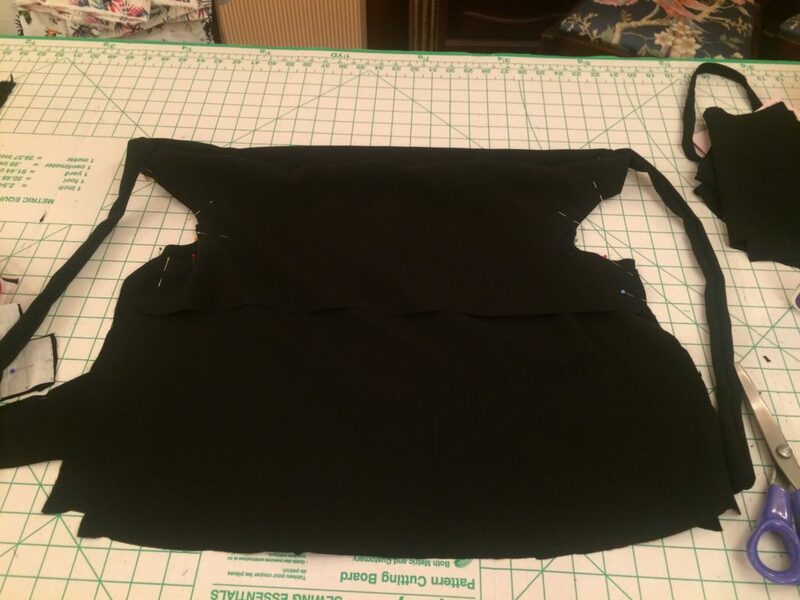 I did a very brief pattern fit, eg I pinned the darts on the pattern and tried on the bodice front and back to see if the fit was ok before I selected the size I needed. 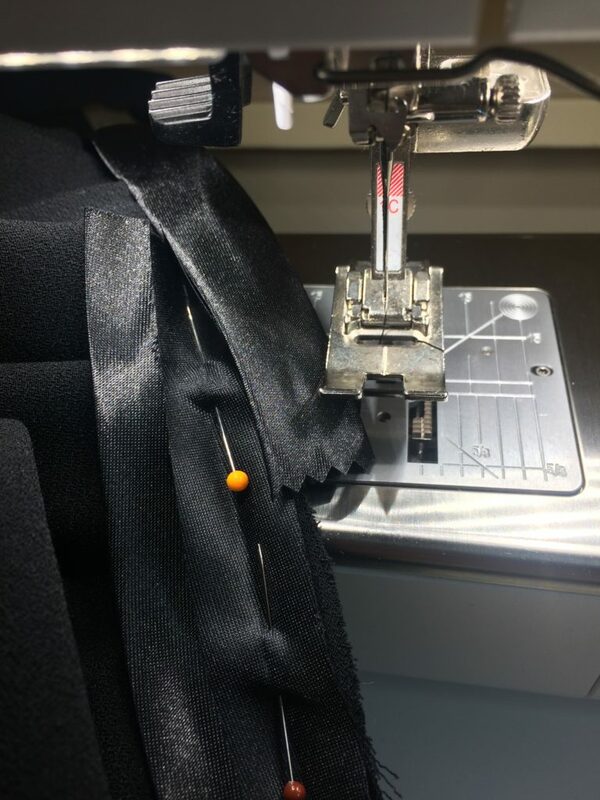 I know I should pin the other way, ie pins at 90 degrees, but as I mentioned I wanted to try it on for fine tuning the fit. 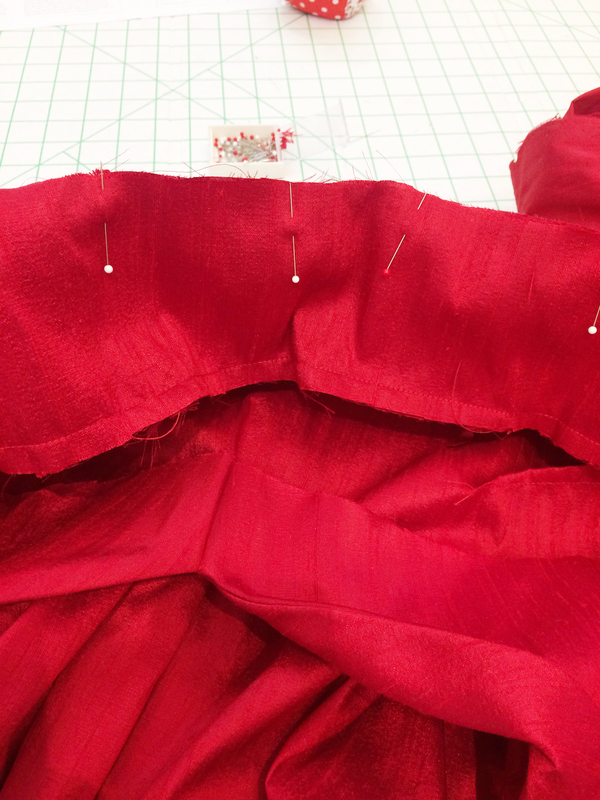 I decided I wanted to use the silk as the lining rather than use cotton or a poly satin. 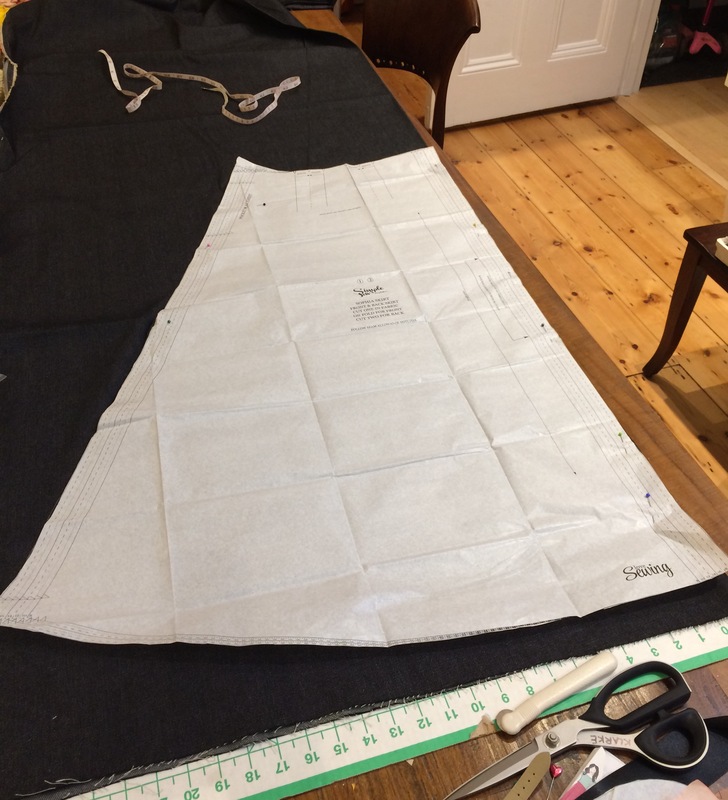 I recently made a dress for the royal wedding sew along and I also used silk dupioni and a cotton lawn for the lining, however, I didn’t like the finish, so decided to self-line this time. 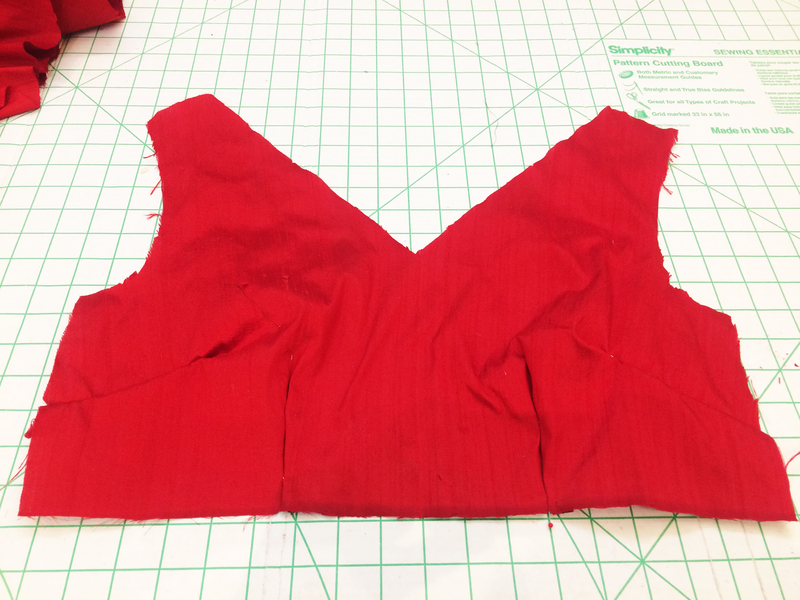 I attached the front and back facings at the shoulders. 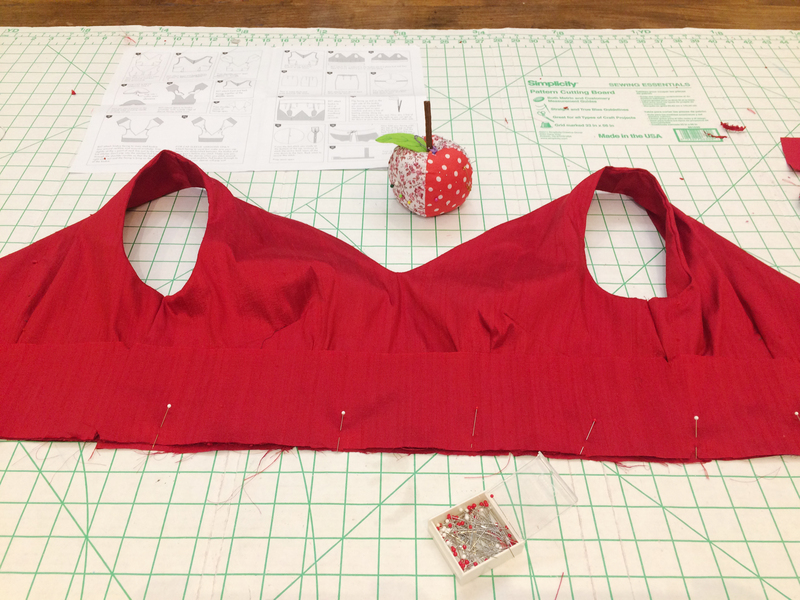 Attaching the waist band to the bodice. 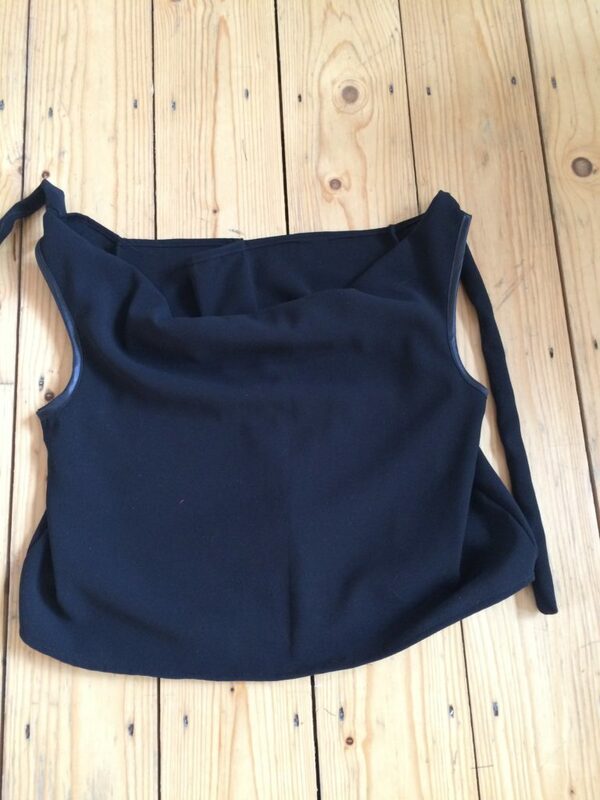 Loving the V neck shaping, will need to get some bra stays so the bra won’t show. 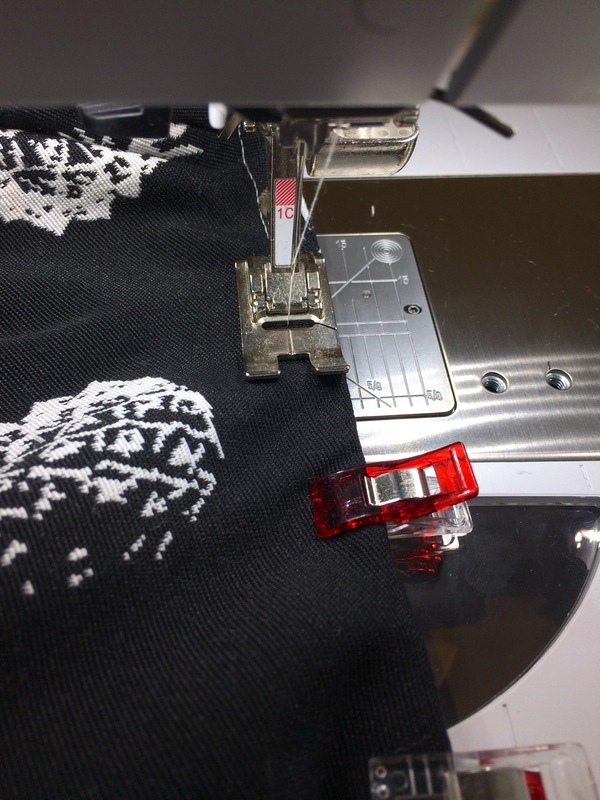 The exciting bit attaching the bodice to the skirt. 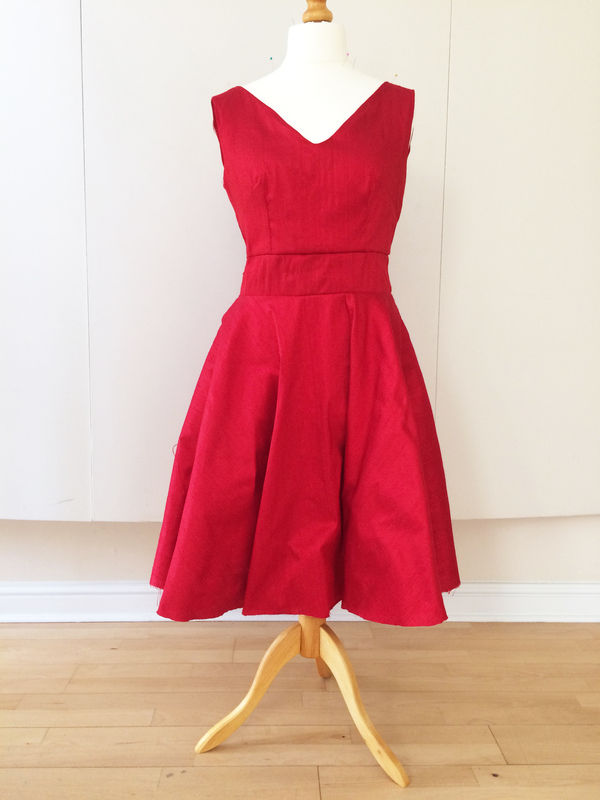 …and here she is Veronika, the red dress, Gorgeous. 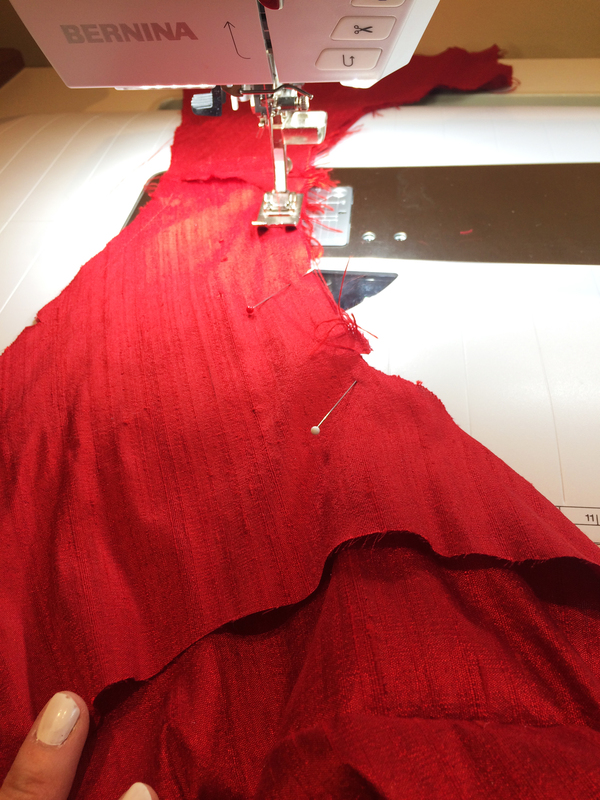 Still hemming and pressing to go. More photos of her in the wild to follow. 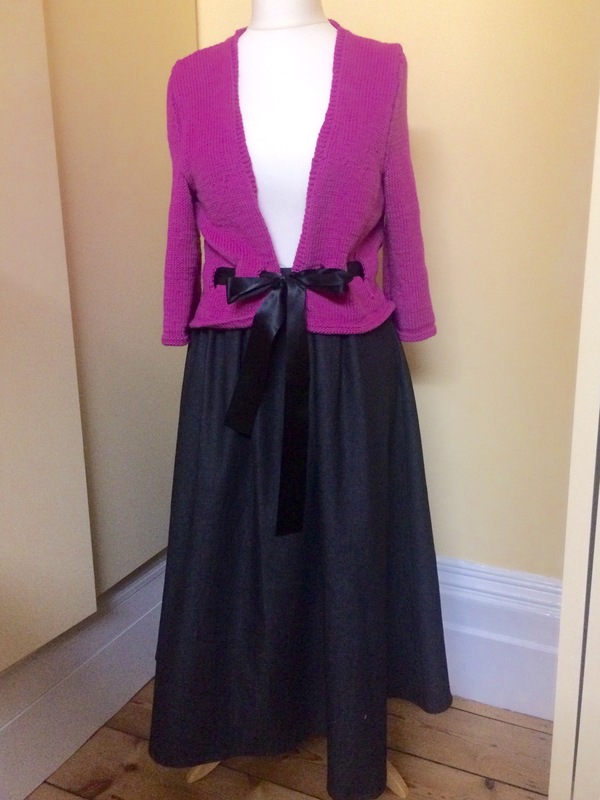 I have also ordered a big red petticoat to complete the look. 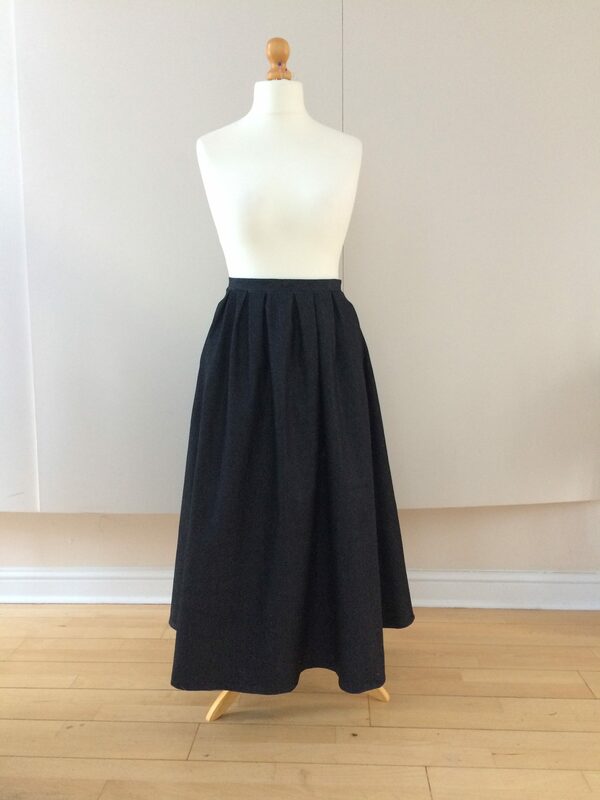 This make for Simple Sew Patterns is the Sophia skirt. 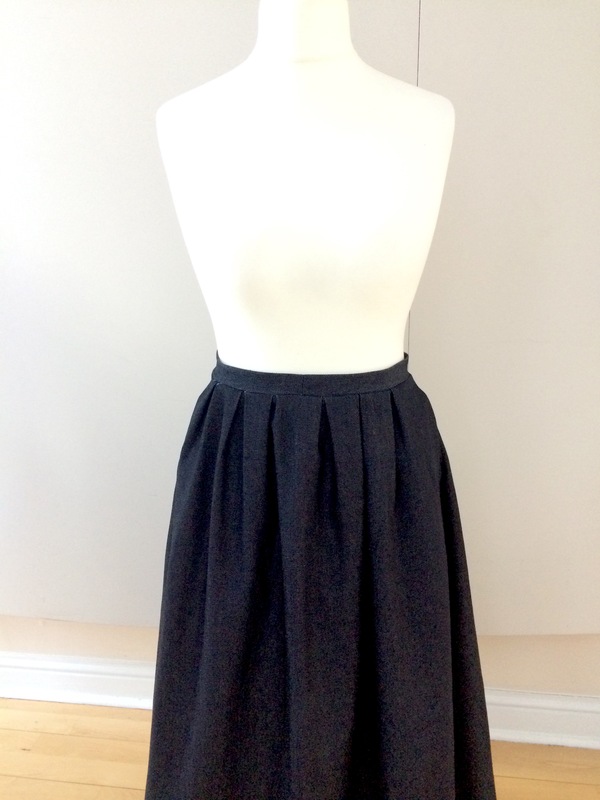 I used lovely black denim from fabric land as I wanted this skirt for the winter autumn months. 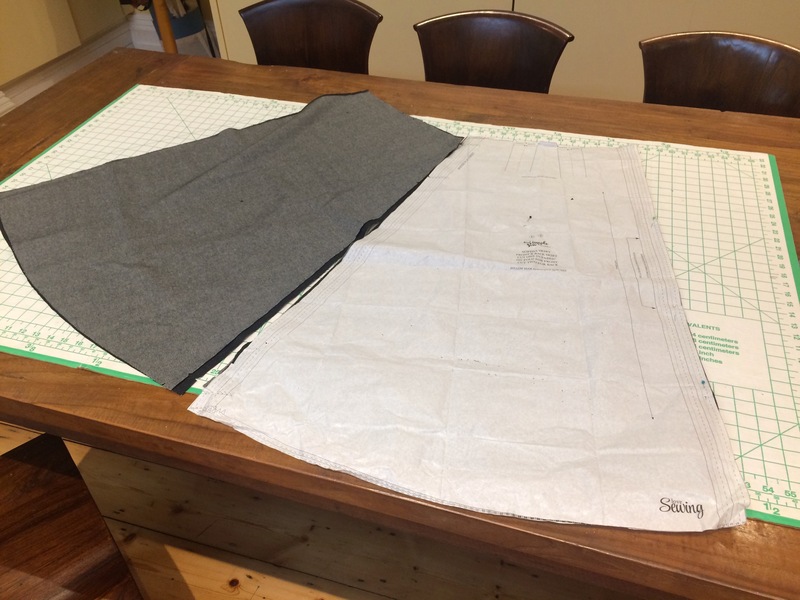 The skirt is made of 3 panels, pockets, and a waistband, so it was super quick to cut. The photo above shows the front panel and the 2 side panel. 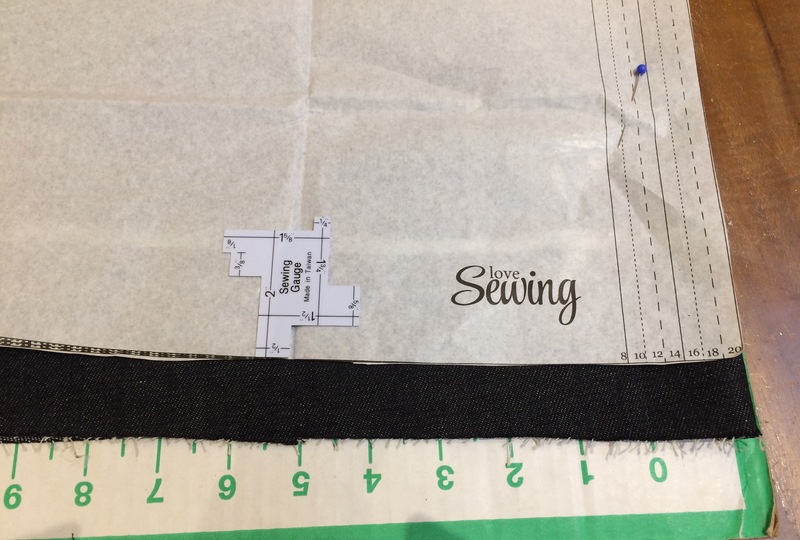 I took 2 inches off the hem as I am 5ft 2. 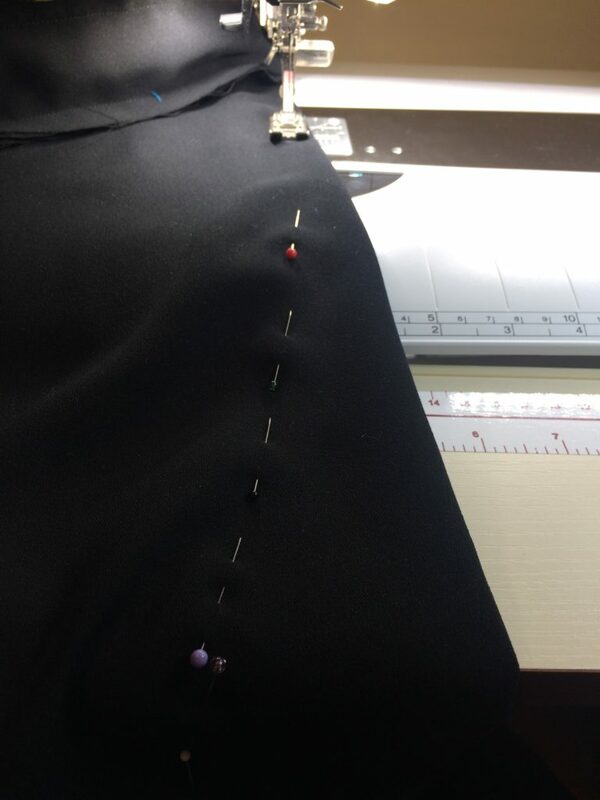 I found the pleats moved slightly when I stitched them, as the fabric had a slight bit of stretch, so I secured them with more pins. 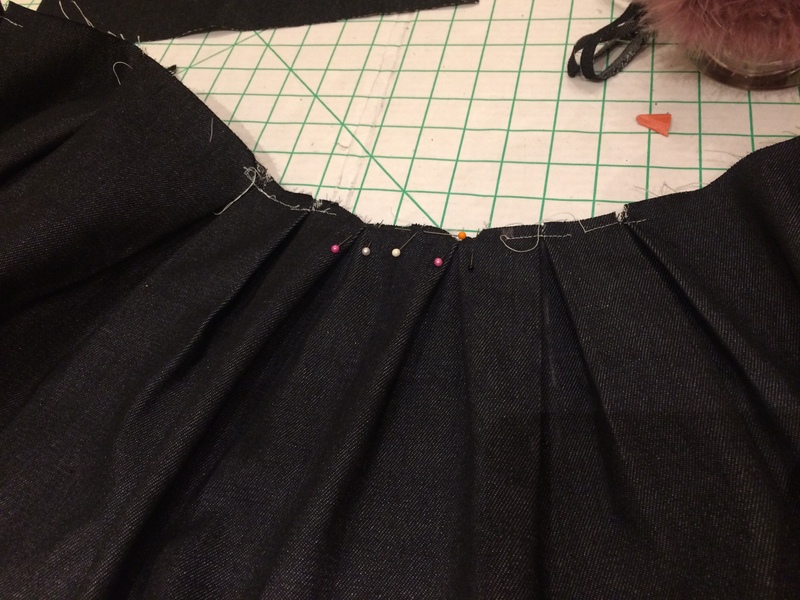 I added a few extra pleats at the front and then basted across all the pleats. 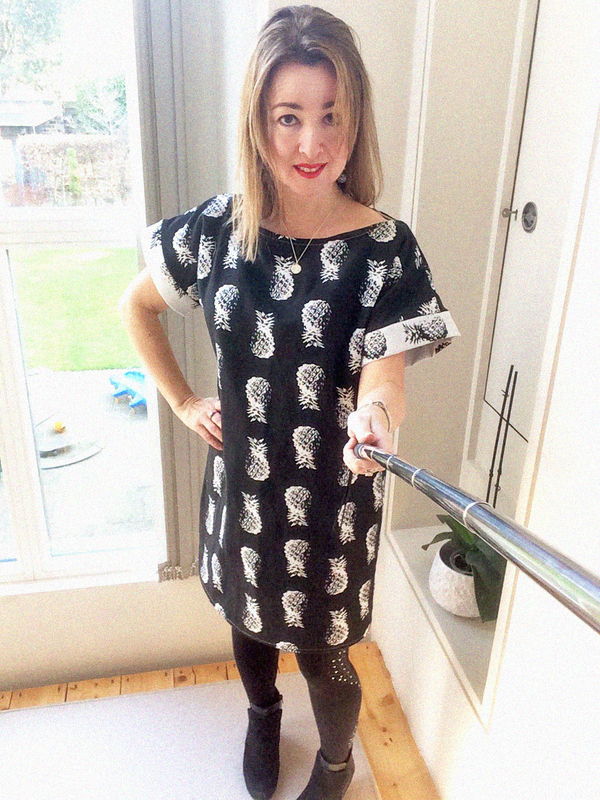 This month, my make from the Simple Sew Patterns company is the Zoe top and dress. 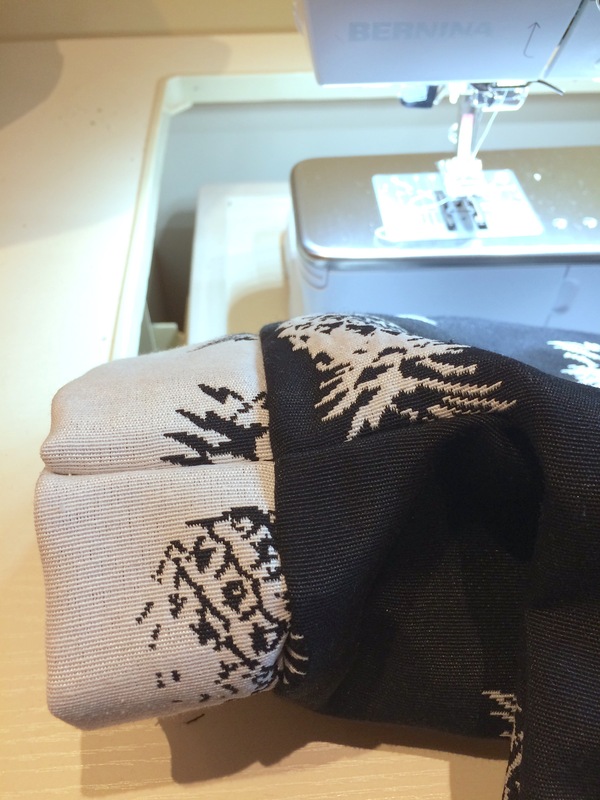 In my stash, I had this black and white 2-meter fabric which is reversible. 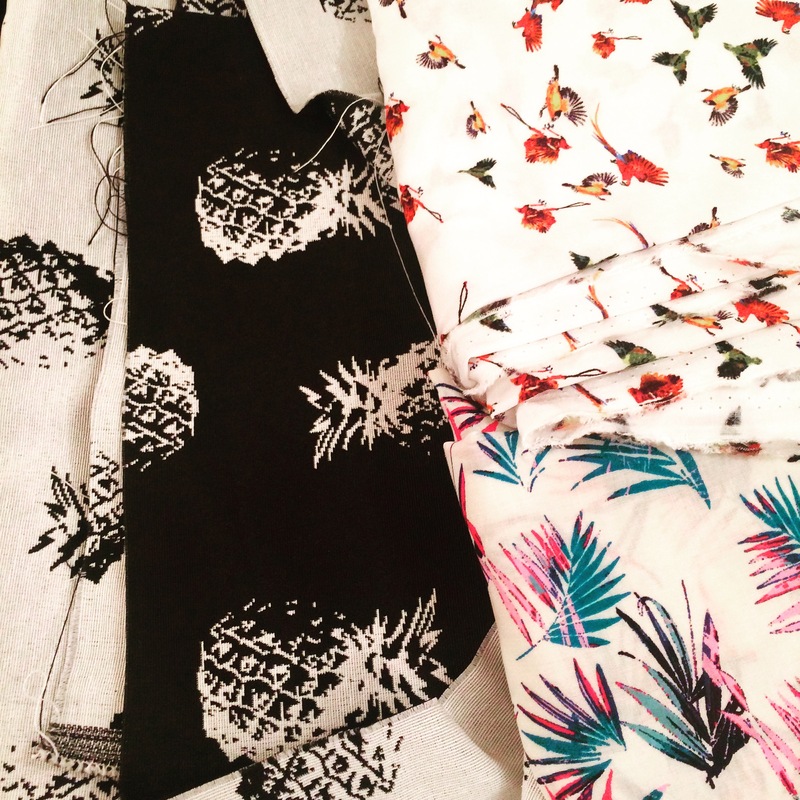 I bought the fabric in a market in Le Touquet, Northen France and always had a dress in mind for it and the Zoe dress, seemed like the best option for it. Here she is all cut out. 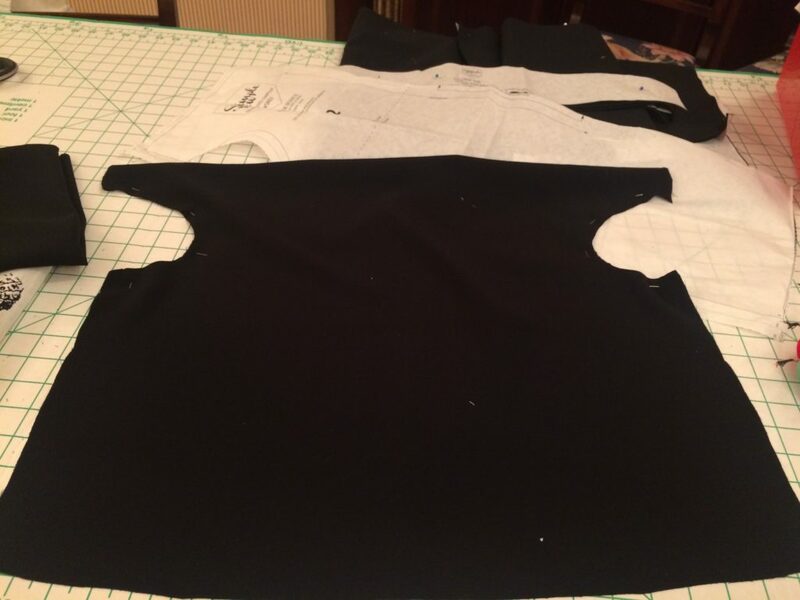 (see below) I cut the facing and arm cuffs and pocket, on the white side and the main body on the black side. 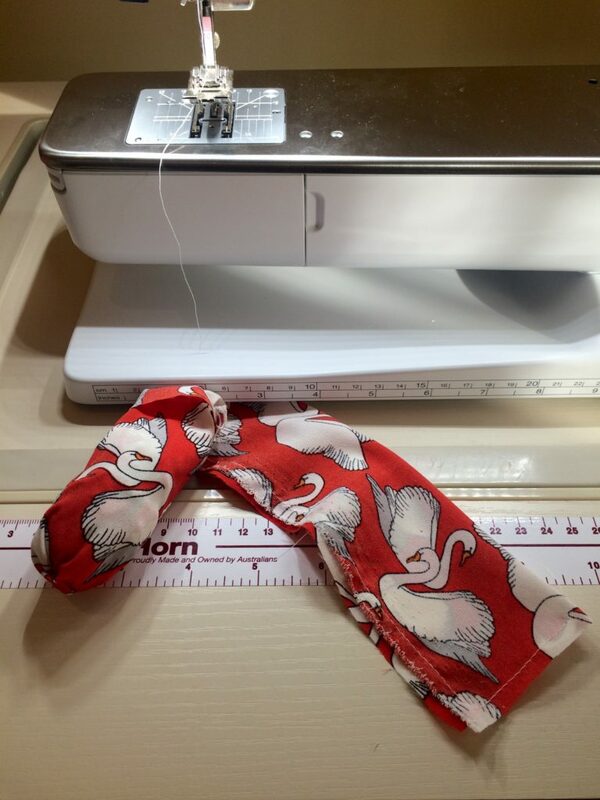 I am 5ft 2 so I took 9.5 inches of the hem! 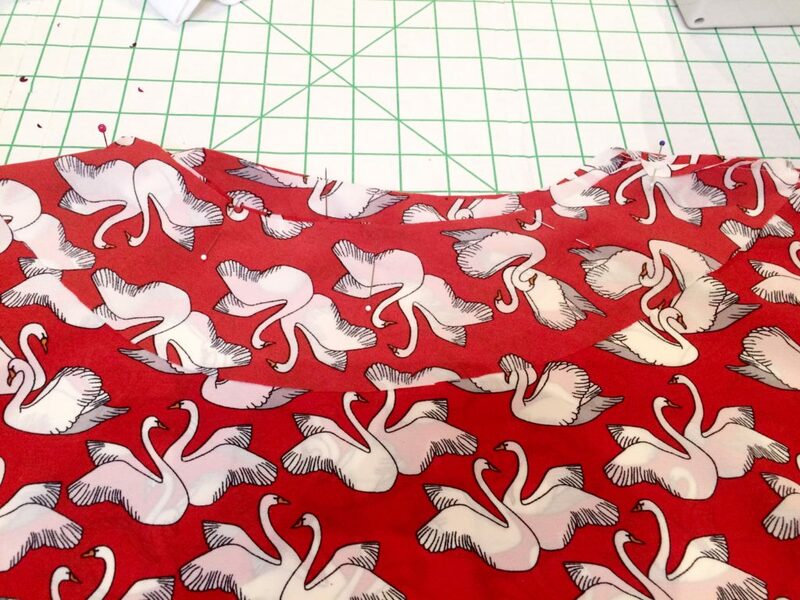 I decided not to cut the front of the dress as 2 panels as the pattern is bold, it would have been hard to pattern match., especially as I only had 2 meters of this fabric. 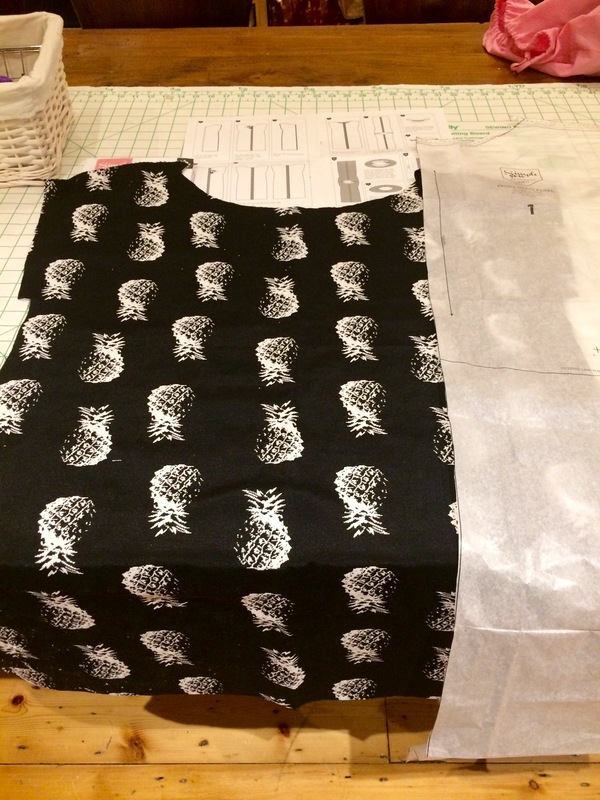 On the back I did cut 2 panels and because I had limited fabric I couldn’t pattern match. 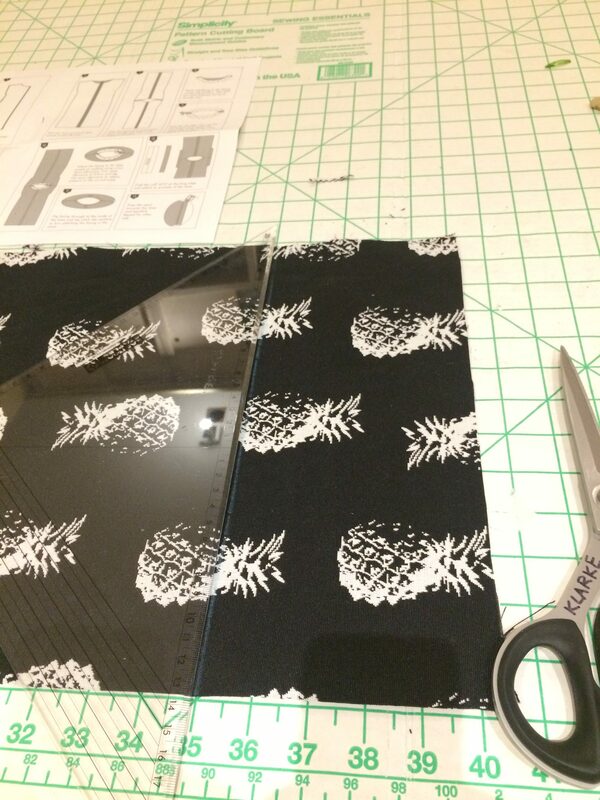 Next time I make it I would cut the back as one panel too. I inserting the neck facking, I used wonderclips and pins to ease the facing in. 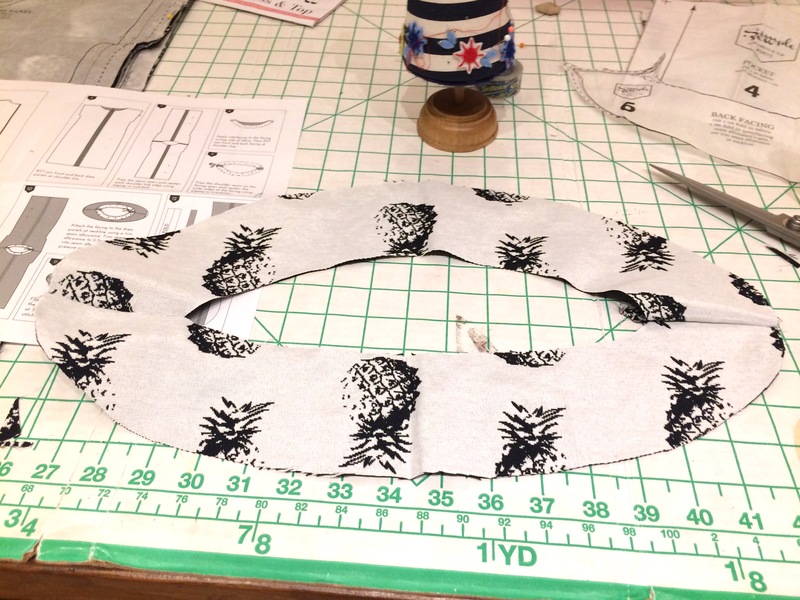 I added the sleeve cuff, once I had sewn the sides up as I wanted to check the neckline wasn’t too wide, which it wasn’t. 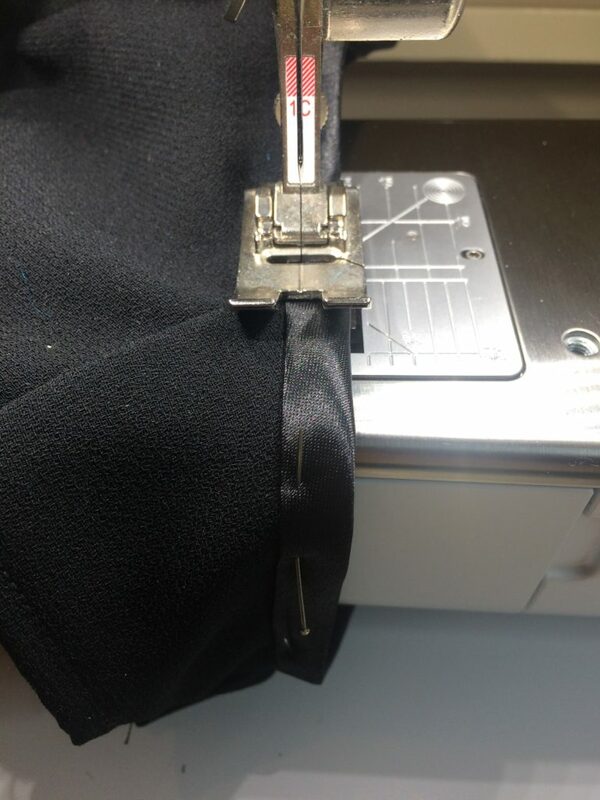 I would suggest that you follow the instructions that is a much better way of getting a match on the cuff seams. joining the arm cuffs after I had sewn up the sides did make it a bit trickier but I wanted to make sure the fit of the neck was ok.
Phew I managed to line it up ok!! Stick to the instrutions kids it’s easier!! 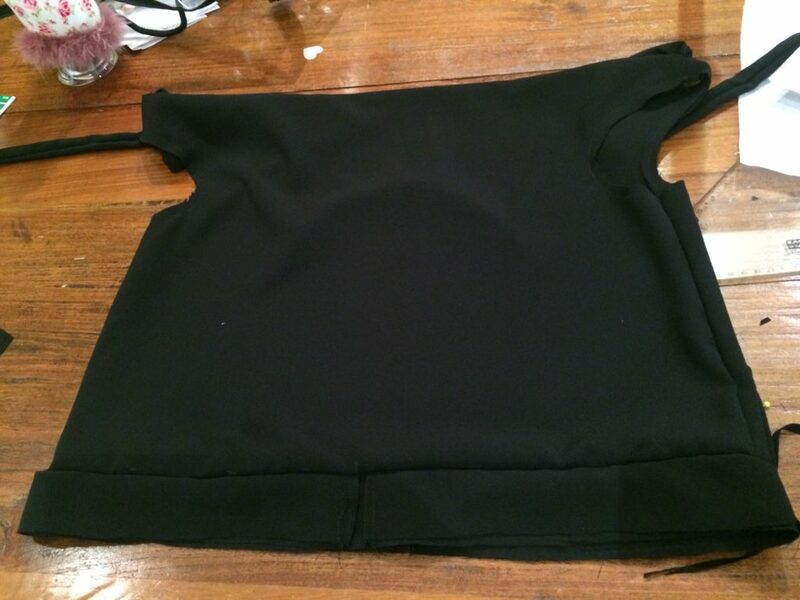 and here she is with and without pockets…cant decide yet what I prefer. 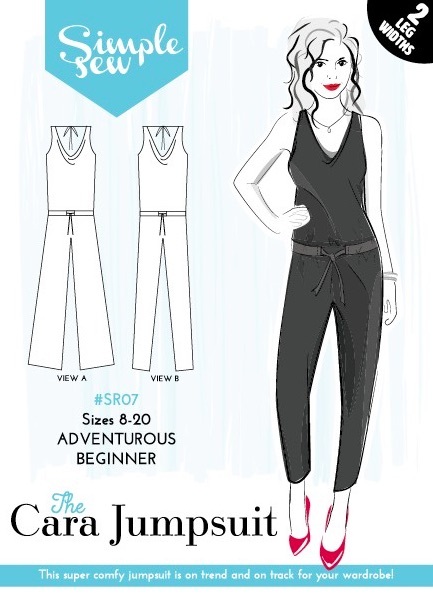 For my next make for Simple Sew Patterns is the Cara jump suit. 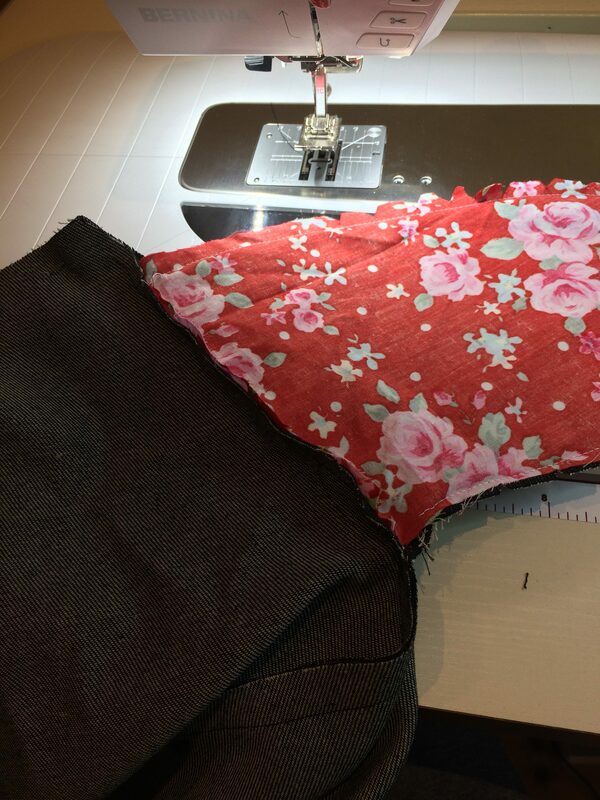 I choose to make the wide leg version which is View A. 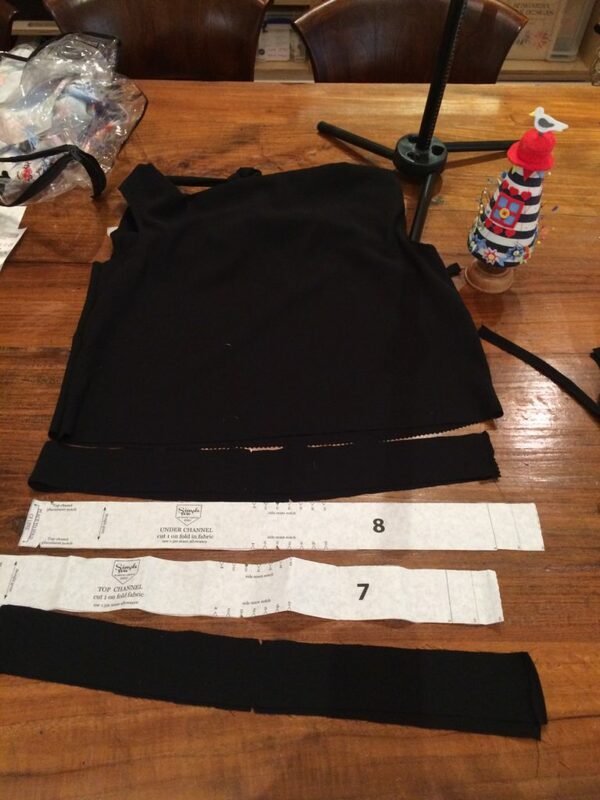 As with all simple sew patterns they are so easy to cut out and the crepe was really lovely to cut. 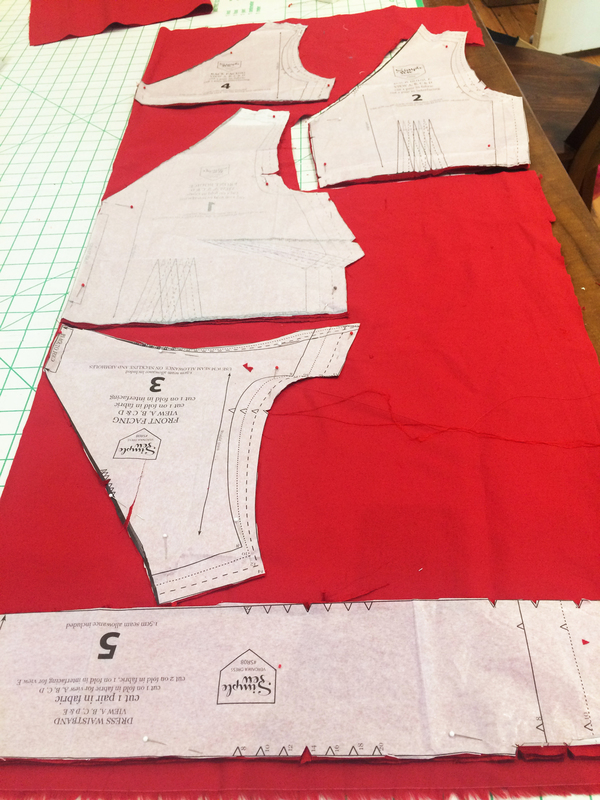 One of my favorite things to do in the process of making a garment is cutting out the fabric…I find it very satisfying for some reason! 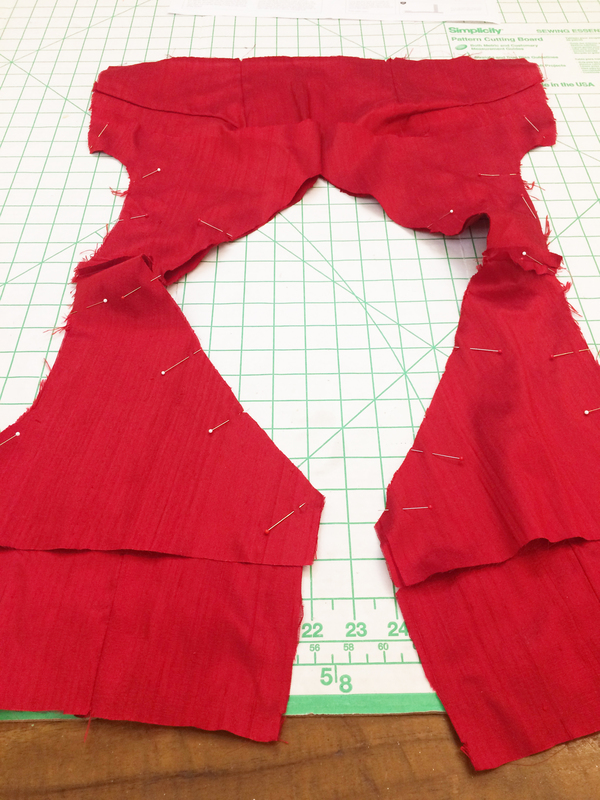 First I cut out the bodice and the ties and waistband, see photo above. 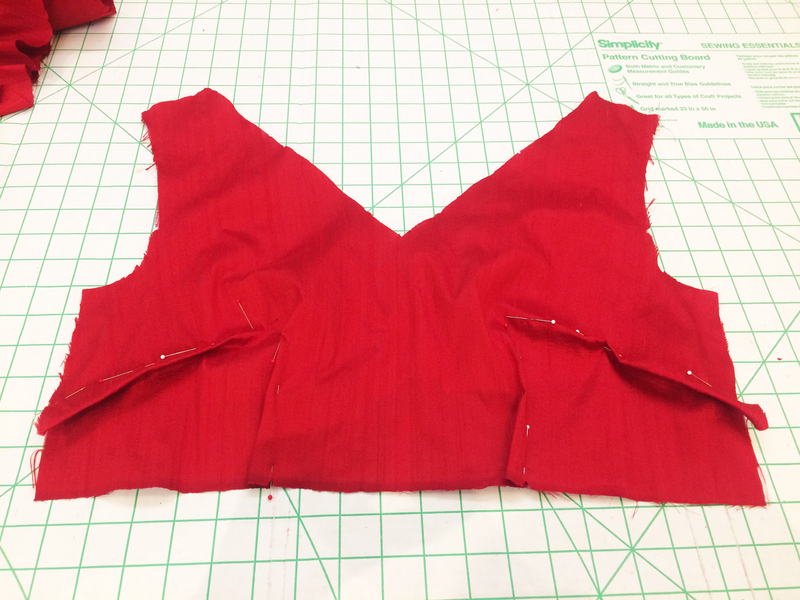 Then I joined the two shoulder seams. Then I made the belt channel. 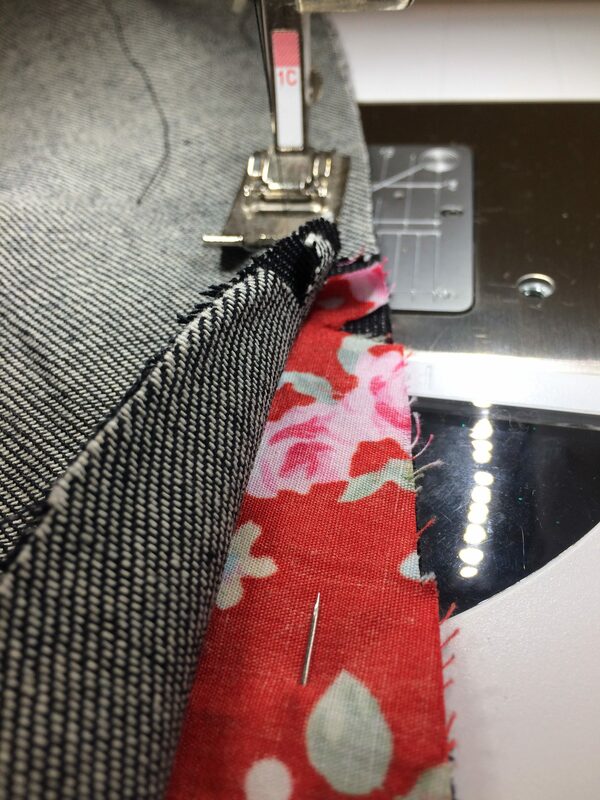 I found this a bit tricky as I hadn’t done this before but once I realized that you are making a ‘tunnel’ for the tie to go through it made sense. 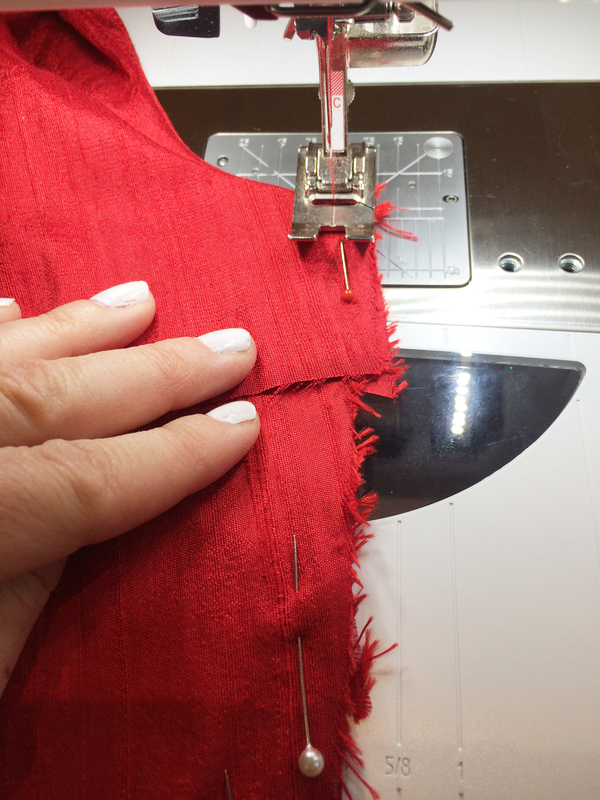 As I am 5ft 2, I shortened the bodice by an inch, to suit my size. 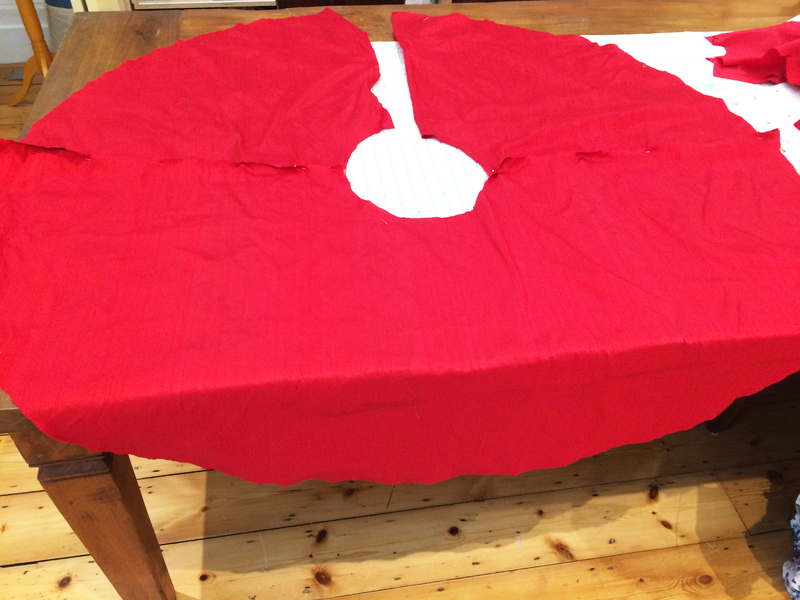 I decided to remove the back ‘cowl drape’ as and I did this by removing a v shape section, which then left a seam down the back. See photo below. 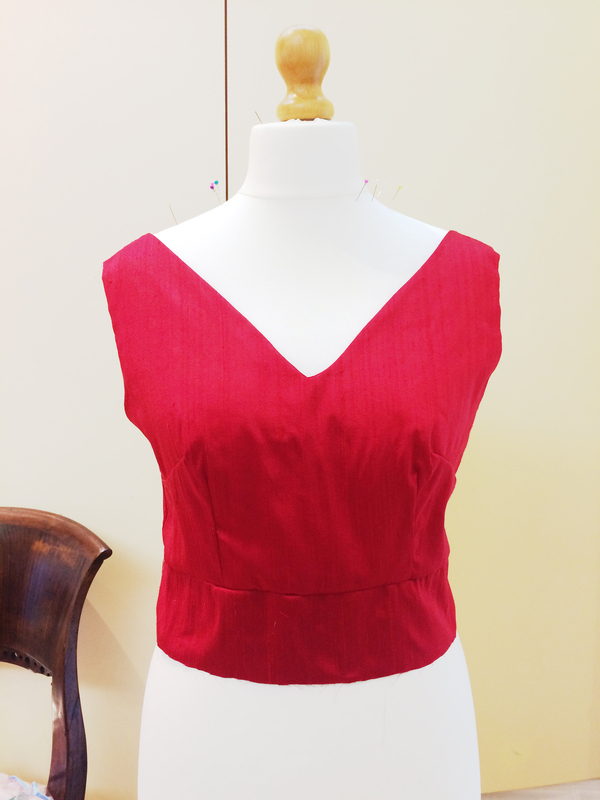 I liked the look of the satin bias binding with the crepe so added that around both arm holes. 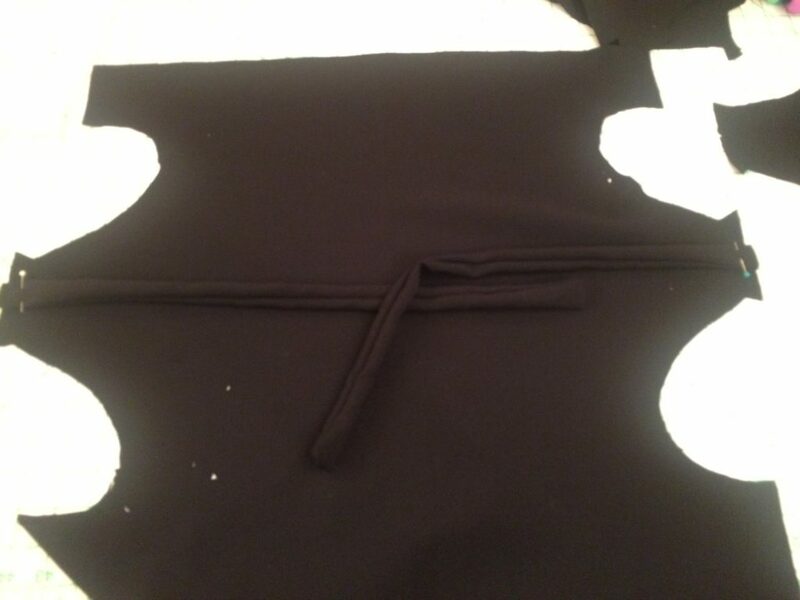 In the end, I removed the channel and added it to the trousers to make a waistband, so that the jumpsuit would become seperates. 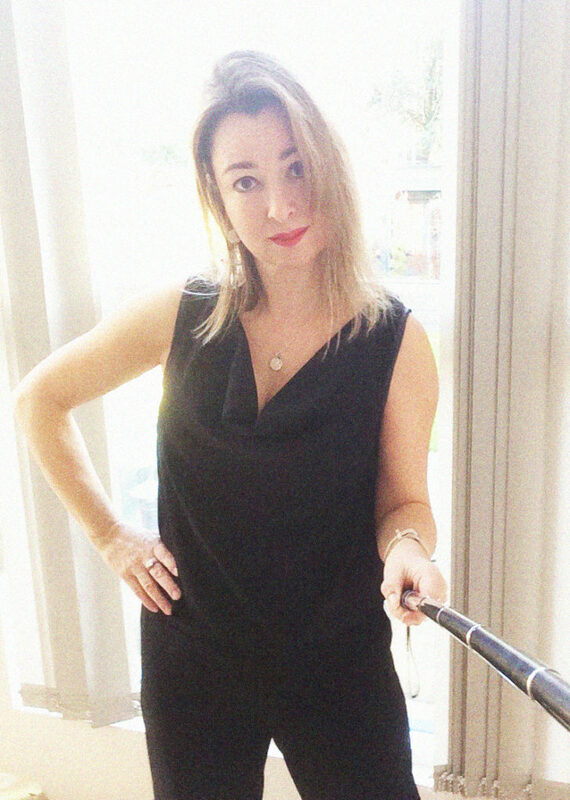 I was happy with it being a jumpsuit but decided it would more versatile having them as separates. 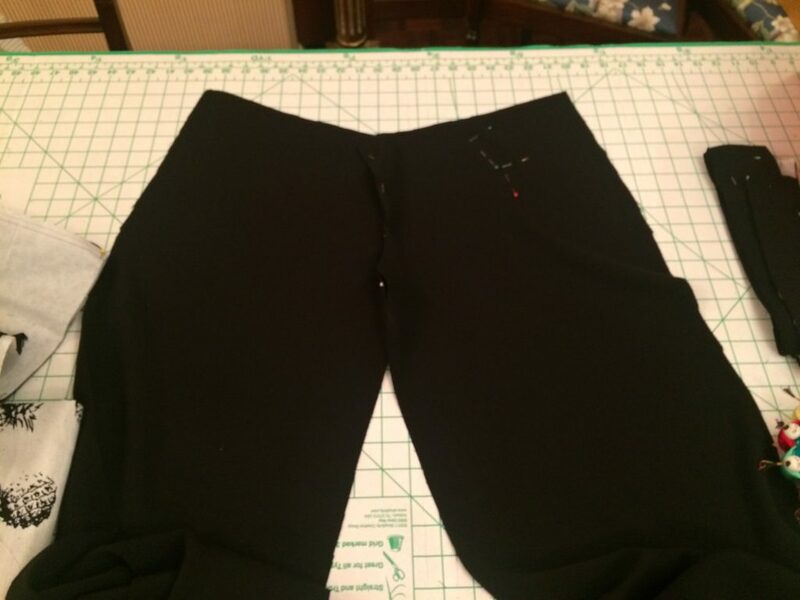 With the top finished I sewed up the side seams and around the crotch, see below. 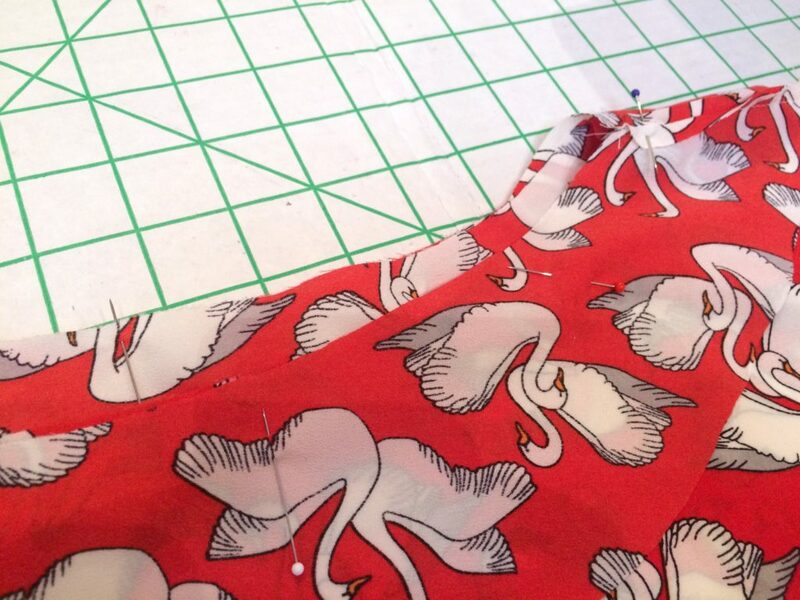 I then used the channel to make the drawstring waistband. 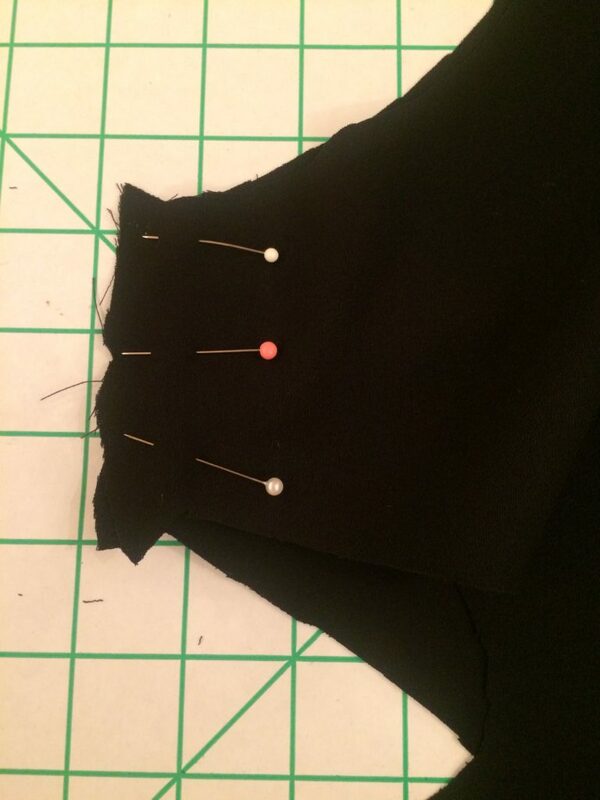 Here is the back view… I ran out of tailors chalk so improvised by using pins to make a B for the back! 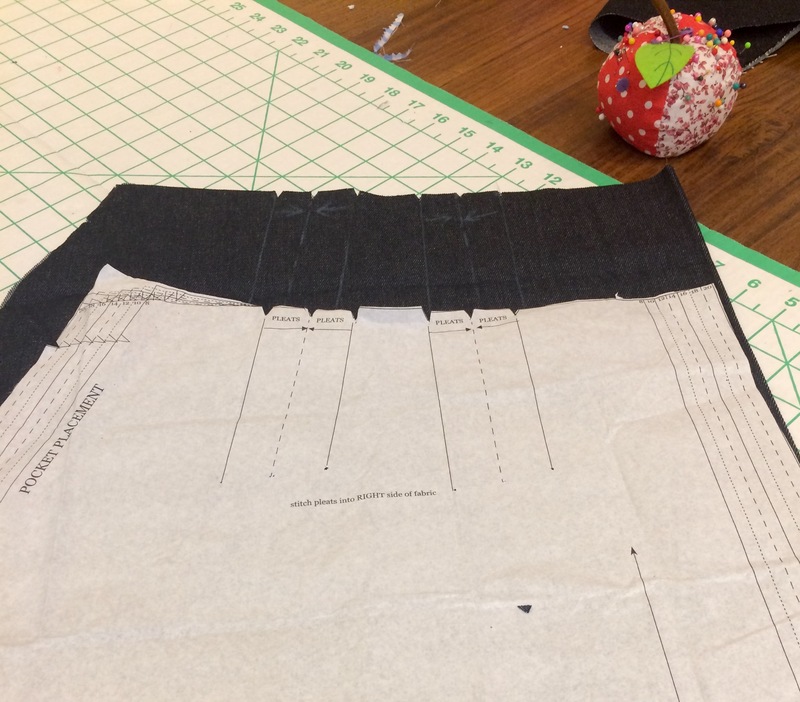 Here is one of the ways that you could use the pattern, with very little modification to make a waistband. 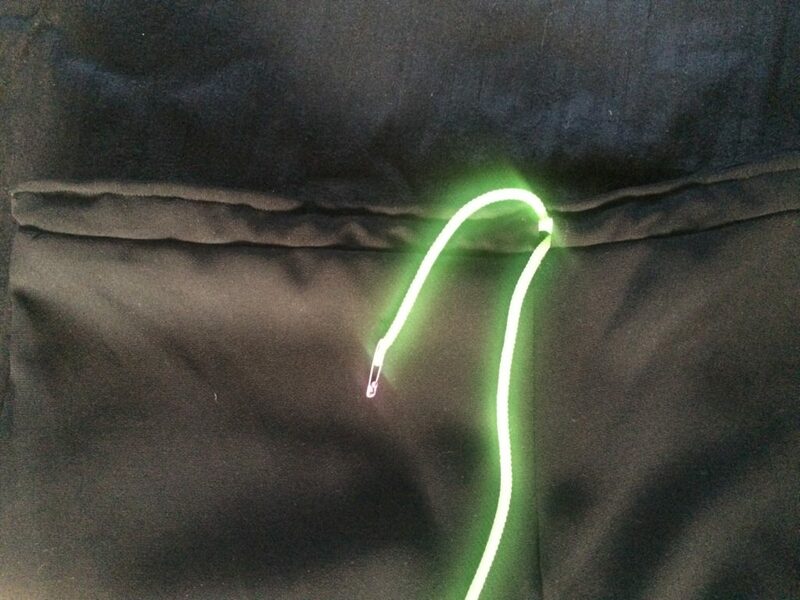 In the end, I used elastic, rather than a drawstring (looks rather strange here like neon glow stick!) 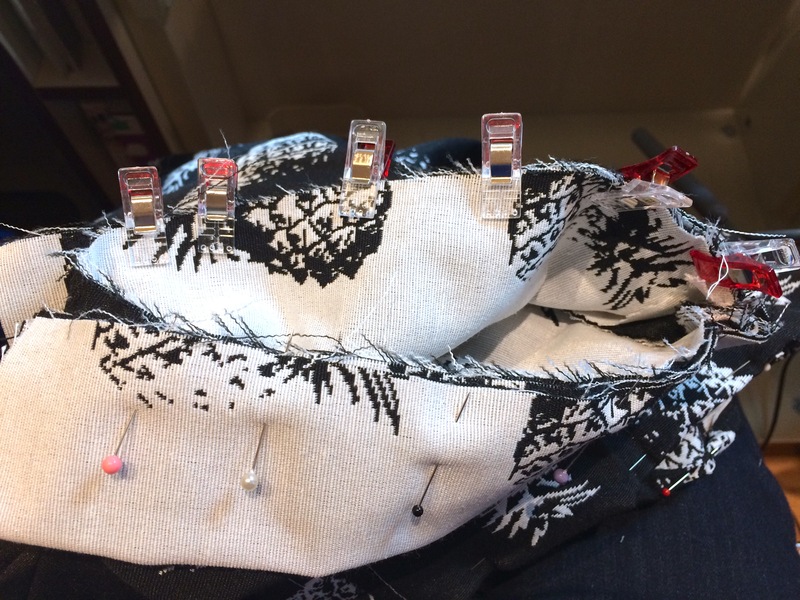 I threaded a cord through to see how it looked before I decided how I was going to finish it. So far so good! 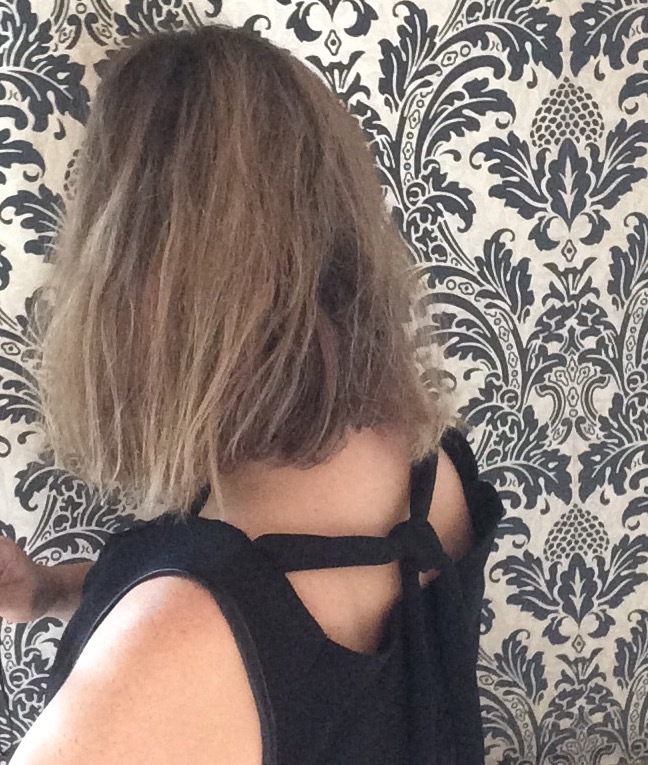 Here is the jumpsuit hacked into a top and flairs. 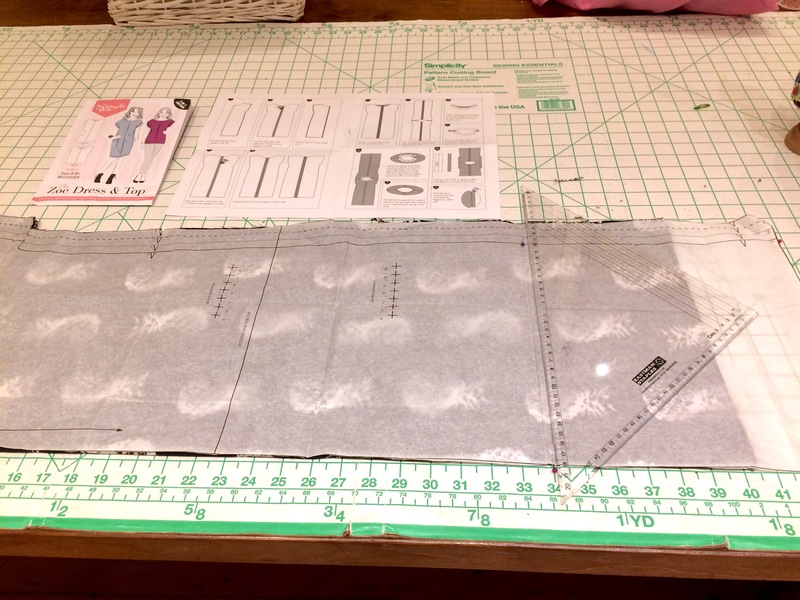 In summary, I found this to be a very versatile pattern. 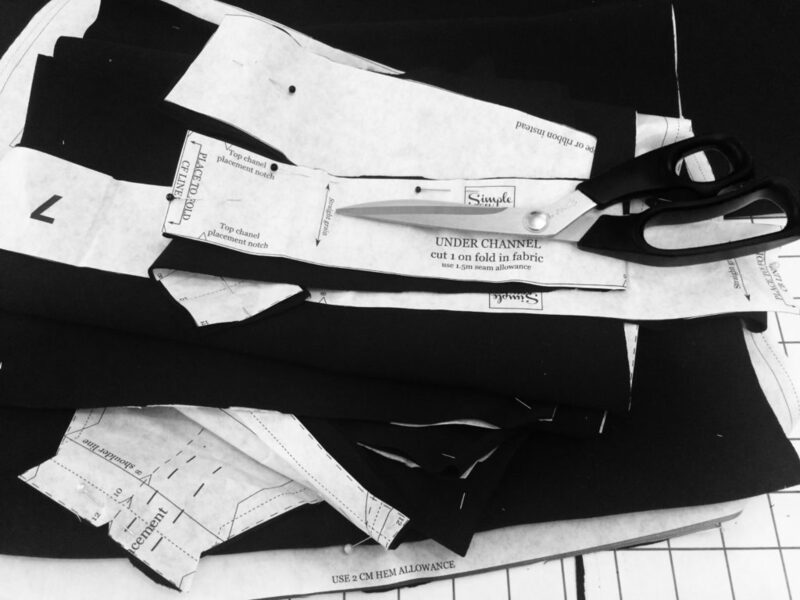 You have the choice to make 2 different styles of jumpsuits, with either wide or straight leg, and the option to make it into separates. 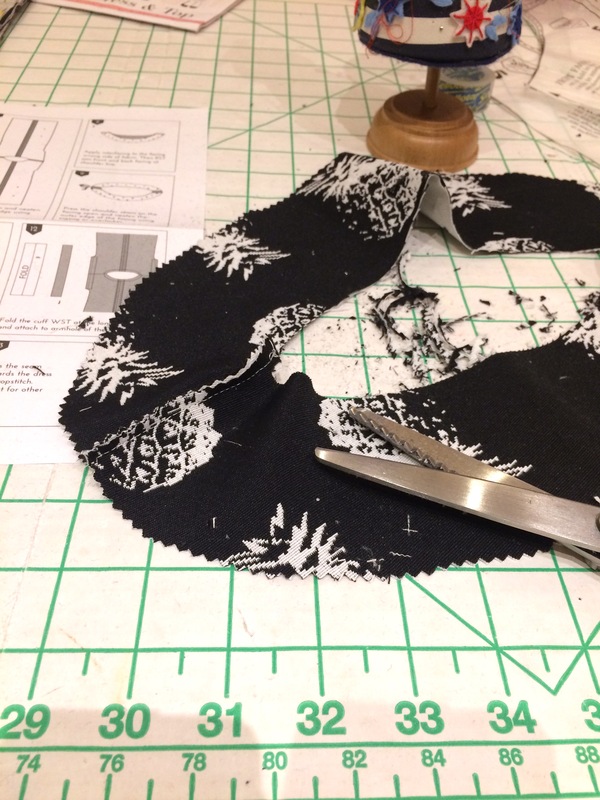 You could even make the top and bottoms off different fabric and designs. 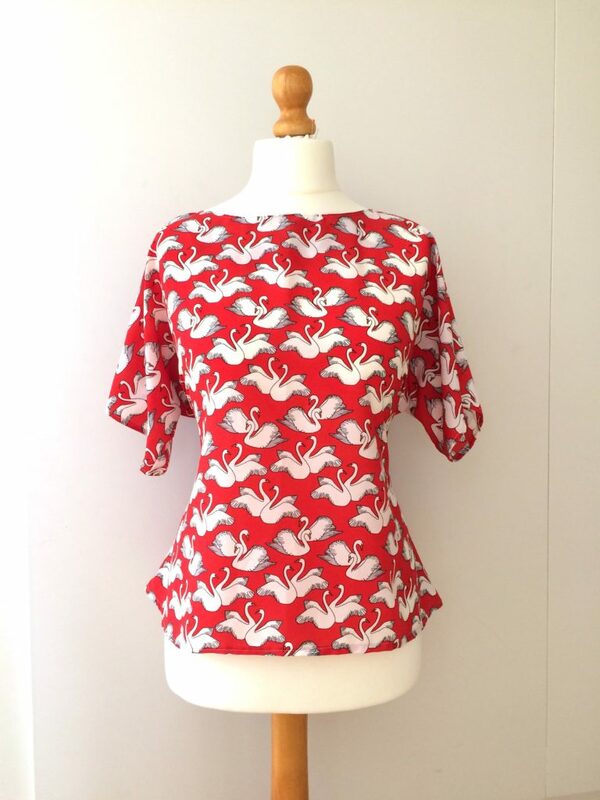 My latest make from Simple Sew Patterns is their Juliette tie back top. 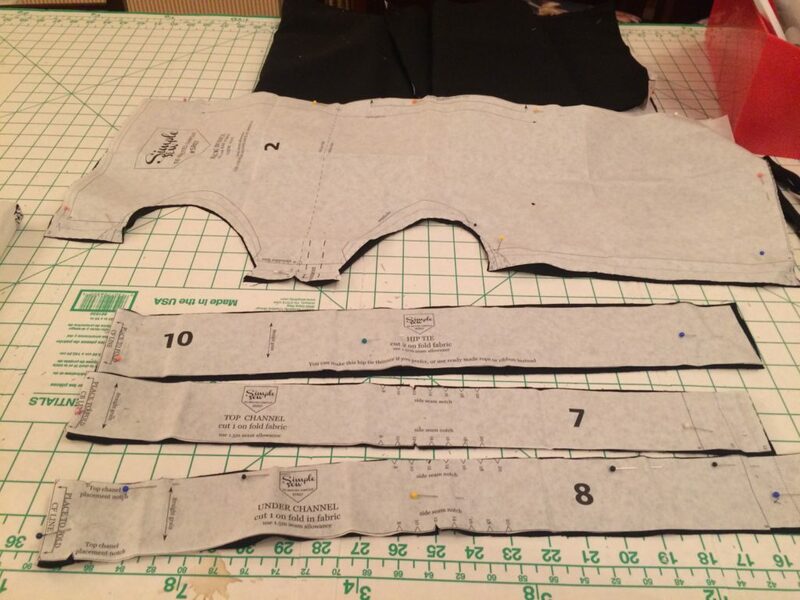 Its a very simple and quick make, there are identical back and front panels, no bust darts and just neck facing and ties…Simples. you could make it in an afternoon. 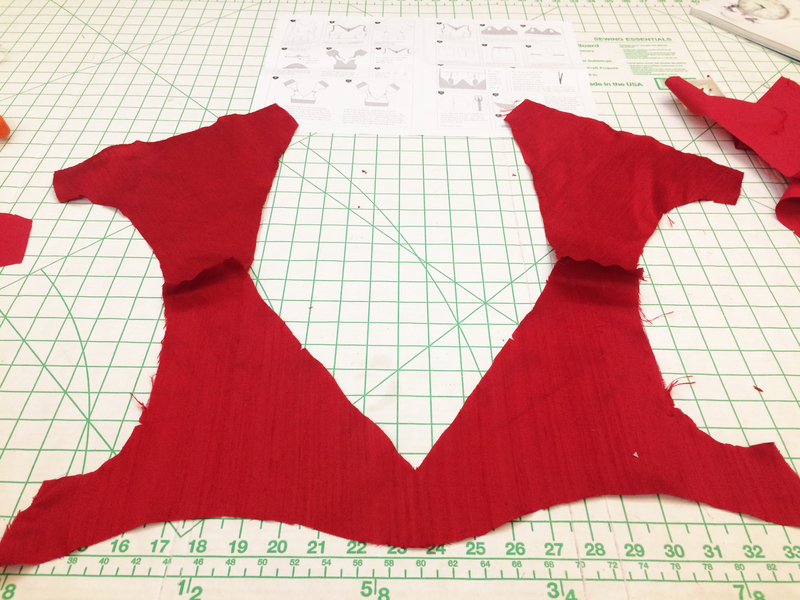 I forgot to take a photo of the pattern laying out on the fabric so will dive right in with how I made the neck facing. 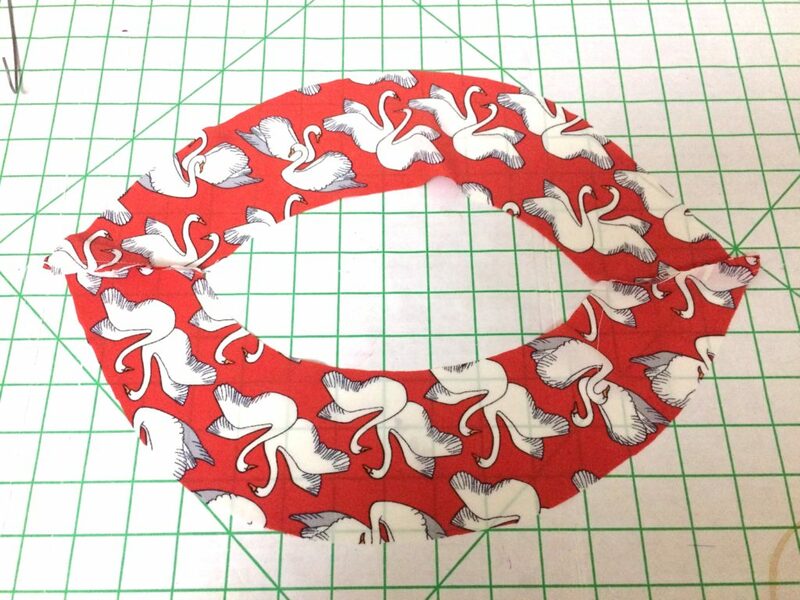 Really simple you join the two c shape facings together to make an oval and stitch each end. 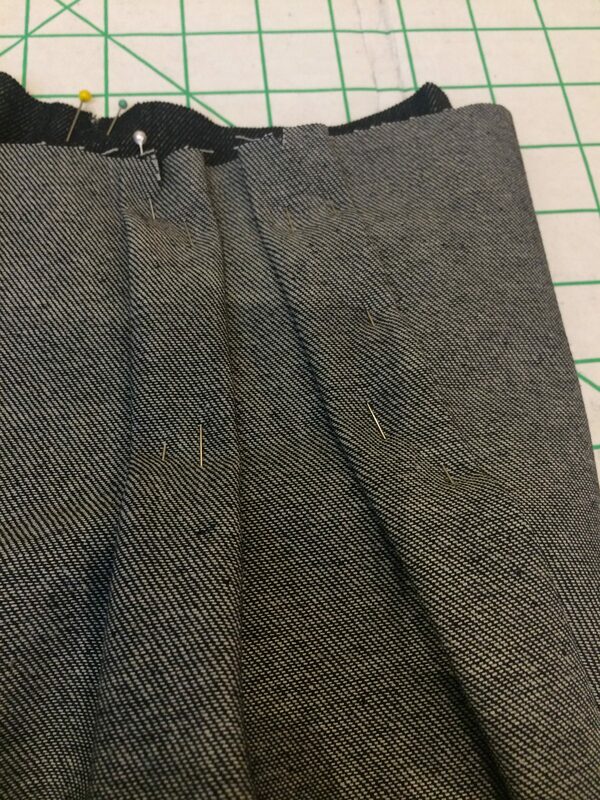 Then sew up the shoulders and the sides, leaving a gap for the ties to poke through. 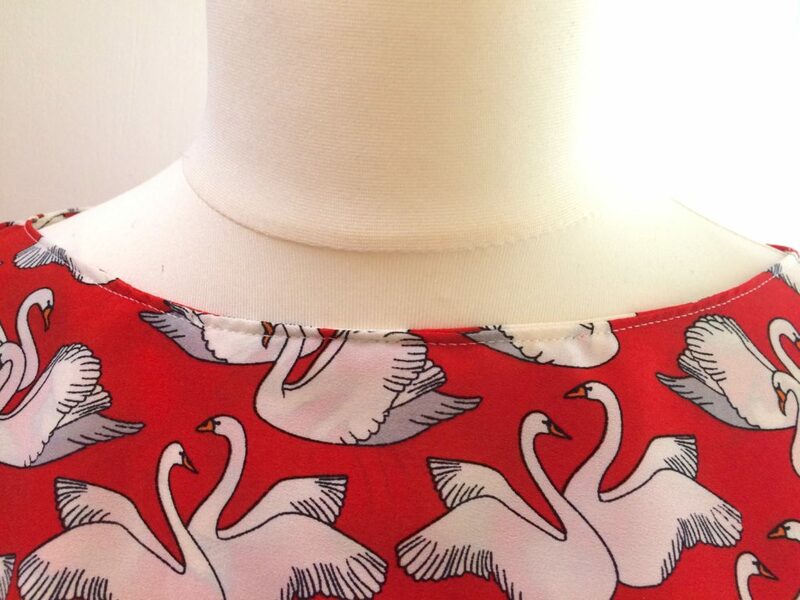 I then pinned the facing to the neckline, right sides together. 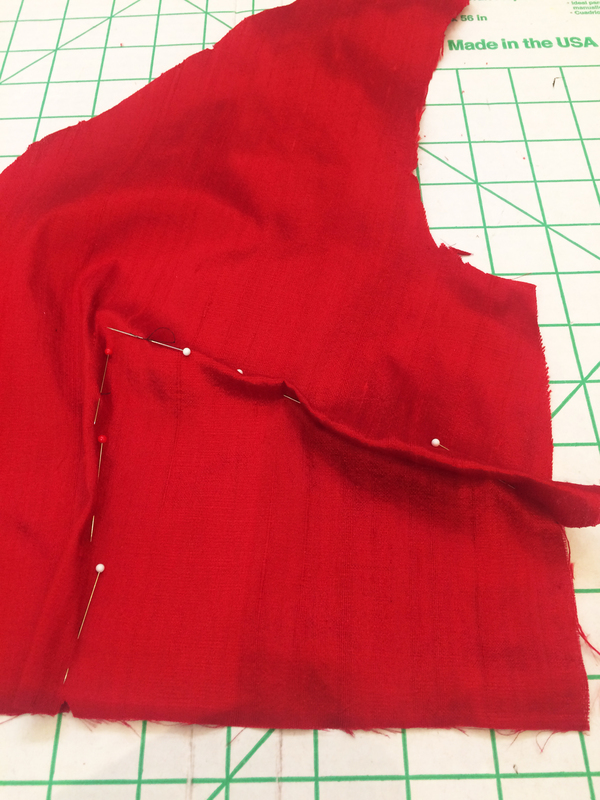 I decided to top stitch the neck line to help the facing to stay in place better. Here it is below, before I pressed it. 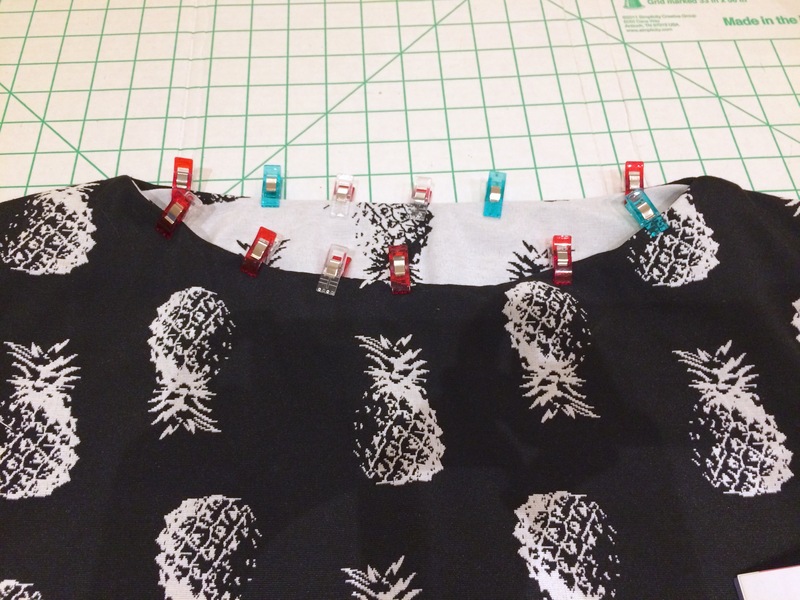 The tie backs were simple to make. 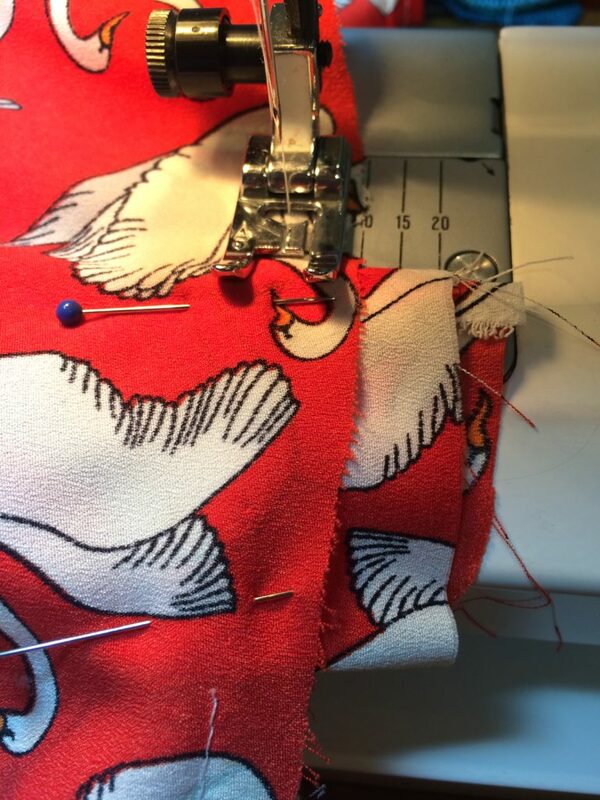 Again put right sides together, stitch along one side and one end and turn. 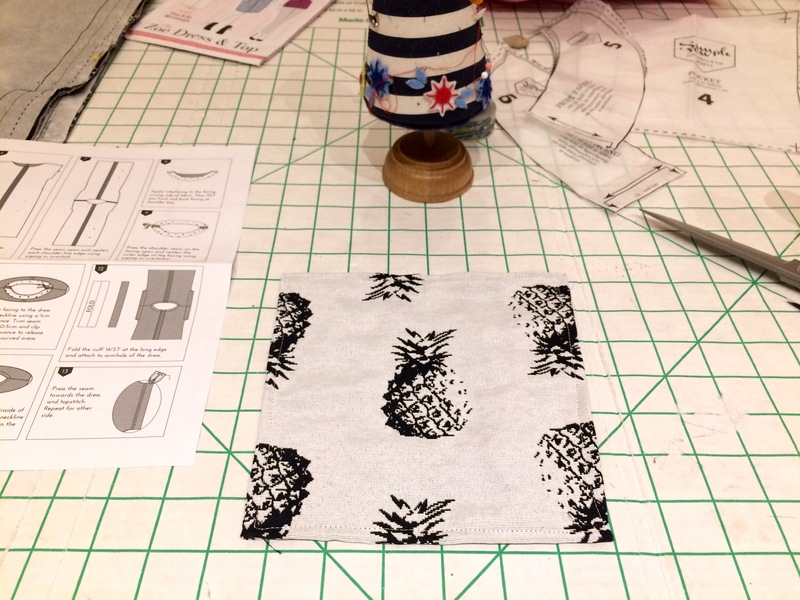 Using this fabric made it really easy to turn! 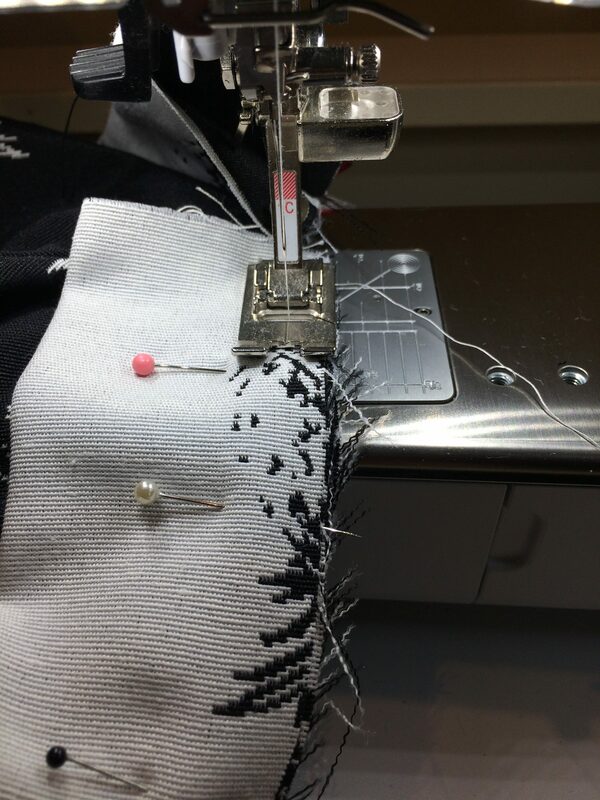 I then, turned the blouse inside out and threaded the tie through the gap I had left, making sure it was in the inside (right side) of the garment. 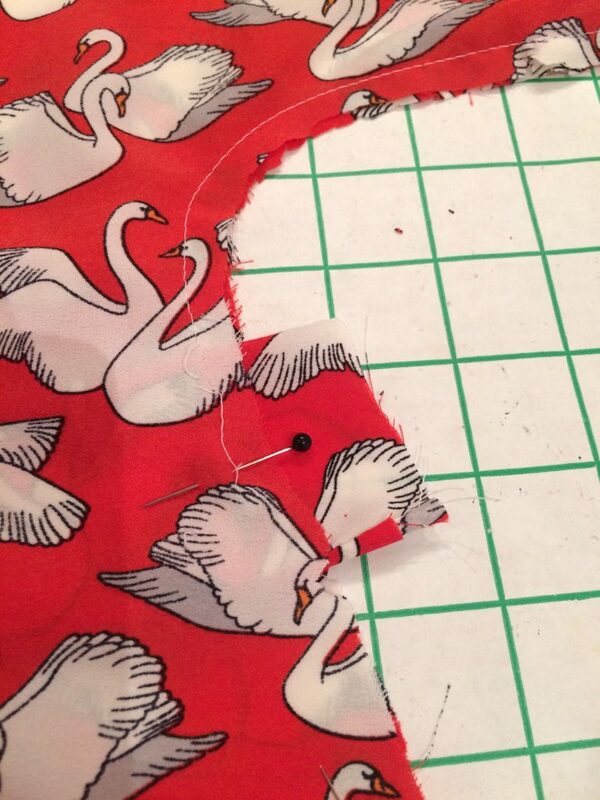 And then I sewed across it. I heed the sleeves and hem and Juliette was done!! 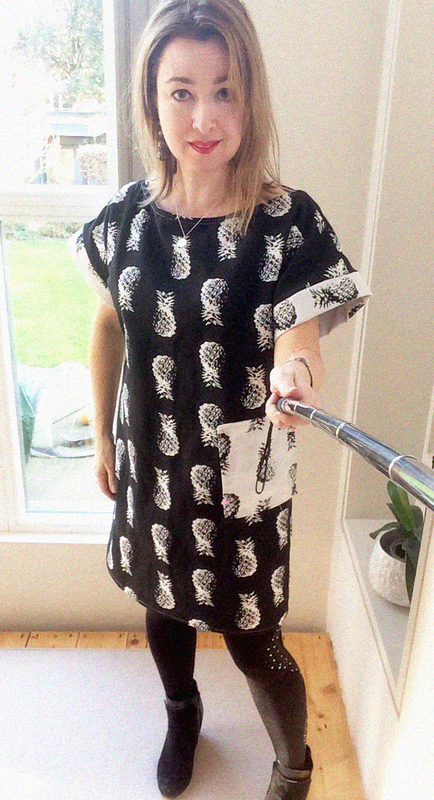 Here she is on Flossie, I will post some photos of me wearing it soon. What a cutie Juliette is. Here is Lovely free pattern from CocoWawa Crafts You Tube Channel. 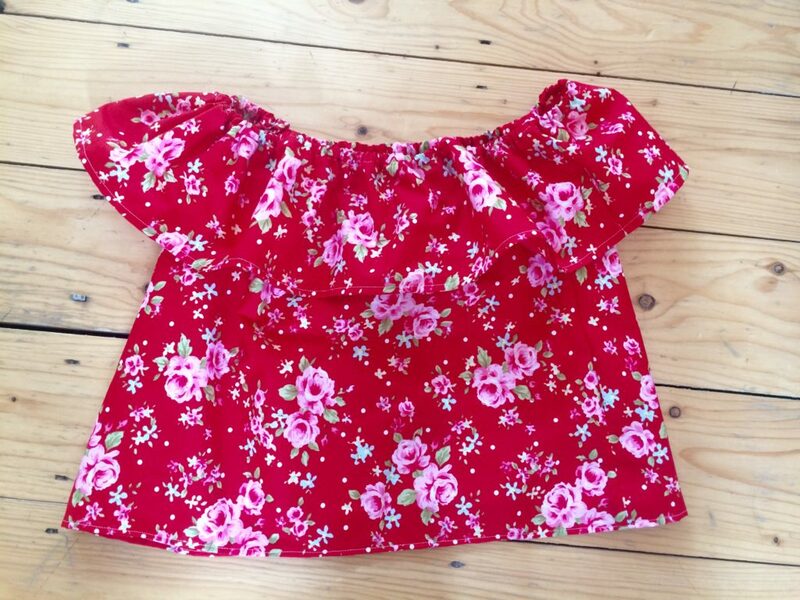 It shows you how to make this top or dress and it didn’t take long to make, I recommend having a look. Ideal make for summer, quick to make and practical on hot days like today. 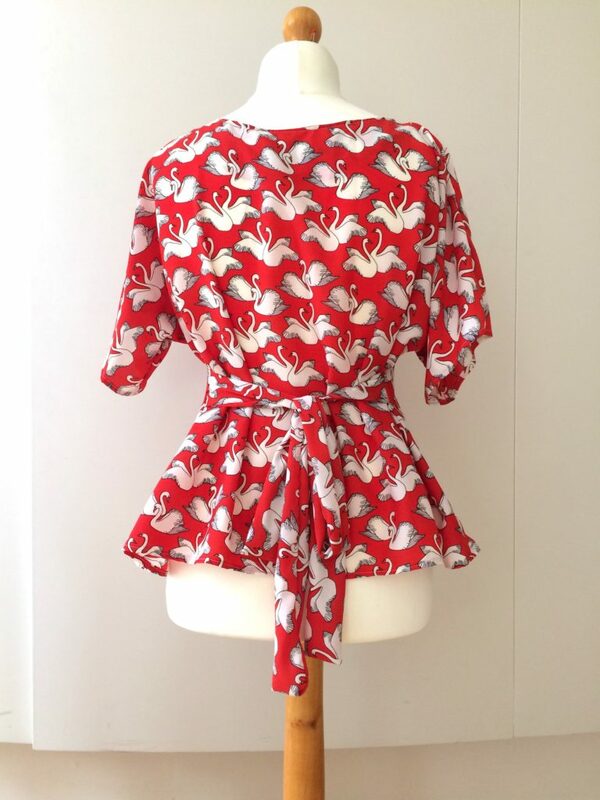 Im off to make a dress version of this in tiny print gingham… watch this space for the results.